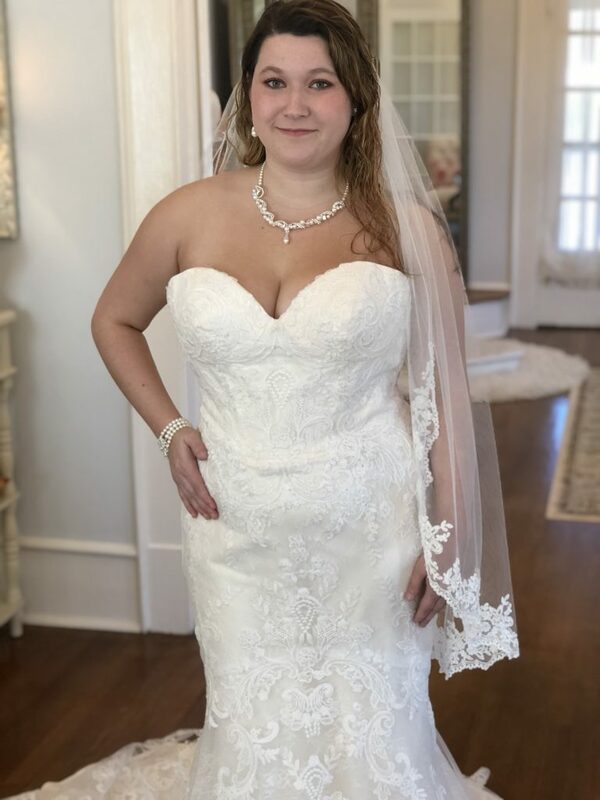 Welcome to 2019 Beautiful Brides! The new year stretches into the future like a nice, white, blank piece of paper waiting to be filled in with all your goals, hopes and dreams. 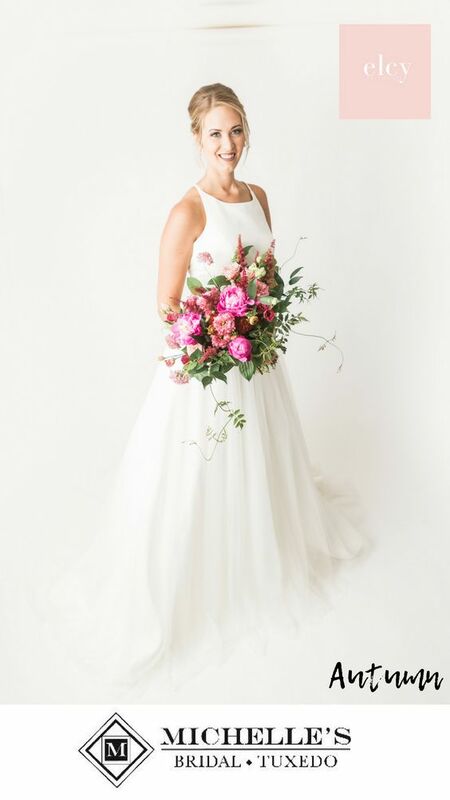 And, in the spirit of new beginnings, we think it is the perfect opportunity to plan for your wedding. After all, what signals a “fresh start” more than getting hitched? 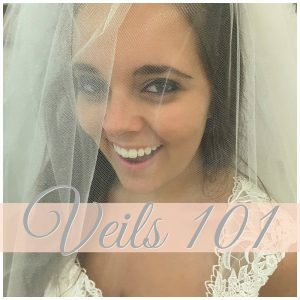 So start envisioning all the things you’ll need to fulfill your wedding day objectives. Since all those details can be expensive, it is a good idea to save anywhere you can. One way to stretch your wedding budget dollars? 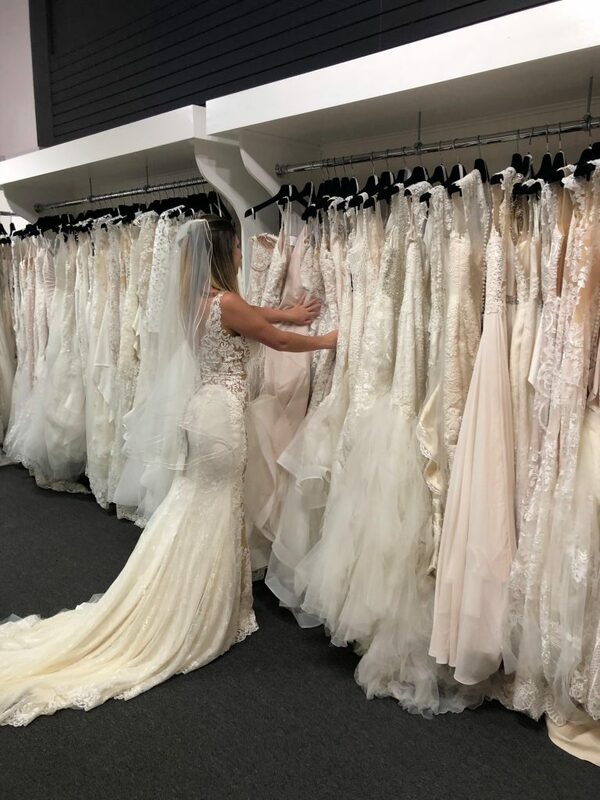 Visit your local bridal boutique to find a gorgeous and affordable wedding dress that you love. (Visit our store locator here!) 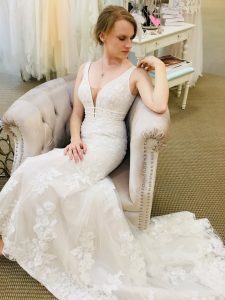 Best of all, bridal salons offer the impeccable service, and the professional experience that you can only receive in a brick and mortar store. 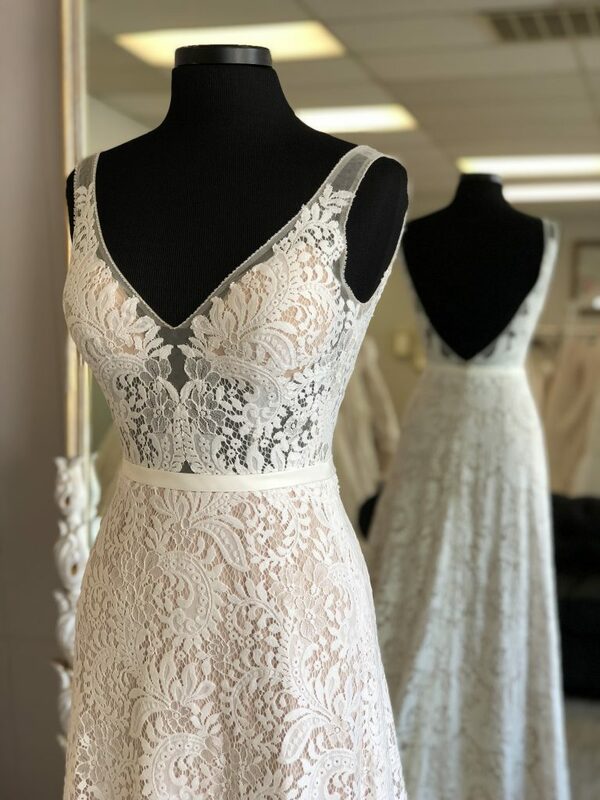 Being able to see and try on dresses in person with hands-on assistance, as well as being able to feel the fabric and consider the construction is only possible in person. 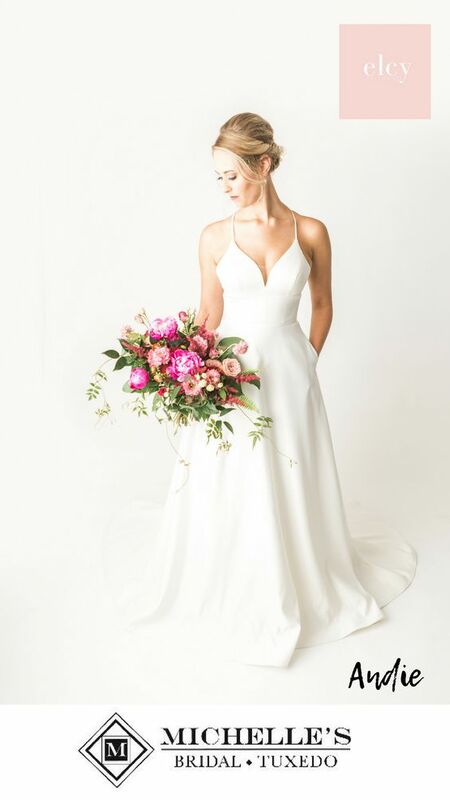 Epiphany Bridal Boutique of Carmel-by-the-Sea, CA has a stunning collection of gowns price below $1299. 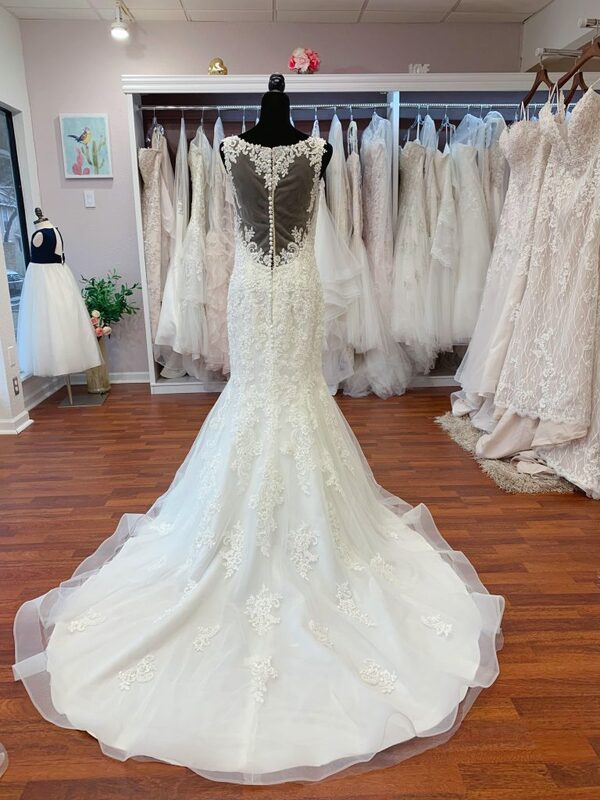 We love the beautiful open back on this one. 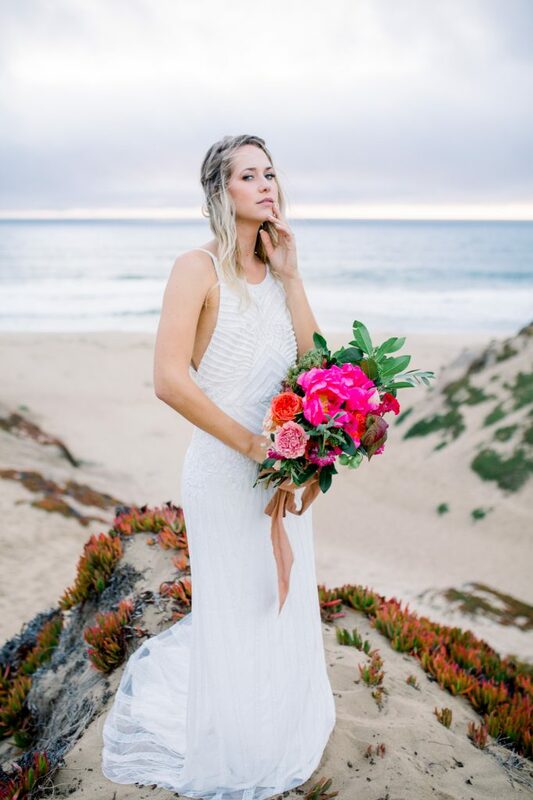 And, the Cali cool girl vibes are apparent in this beachy, carefree bridal gown. 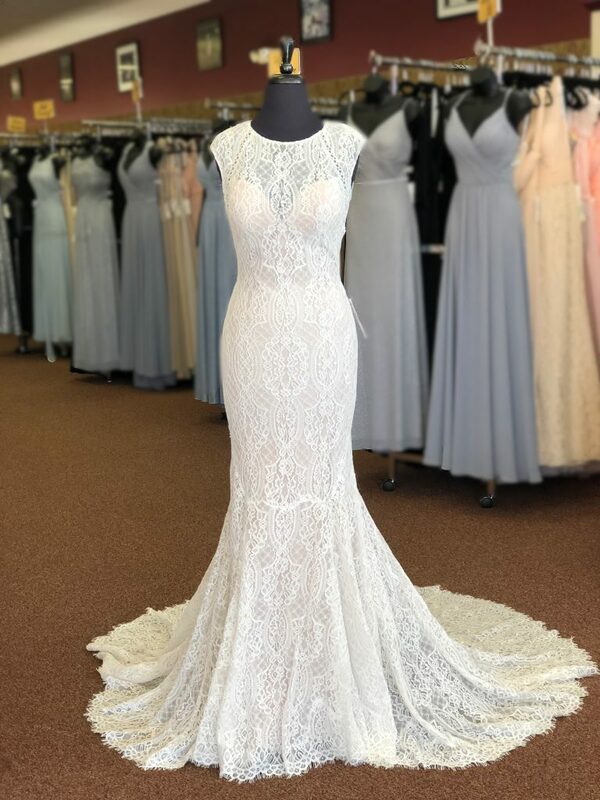 Looking for a high neck lace gown? Look no further than this whimsical option from Epiphany. 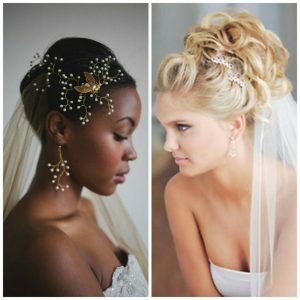 All about the beading? We highly recommend this lavishly embellished stunner. 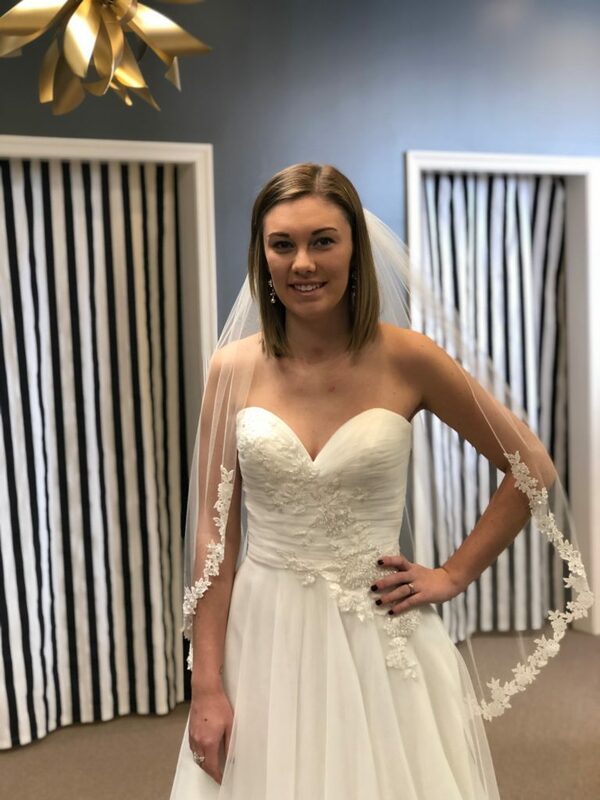 Brides searching for their perfect wedding day look will find a lovely selection at Enchanted Bridal Boutique of Bakersfield, CA. 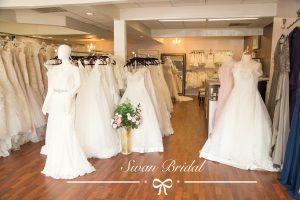 Sara’s Bridal Boutique of Branchburg, NJ is the bridal boutique with the big heart AND a beautiful array of budget gowns! 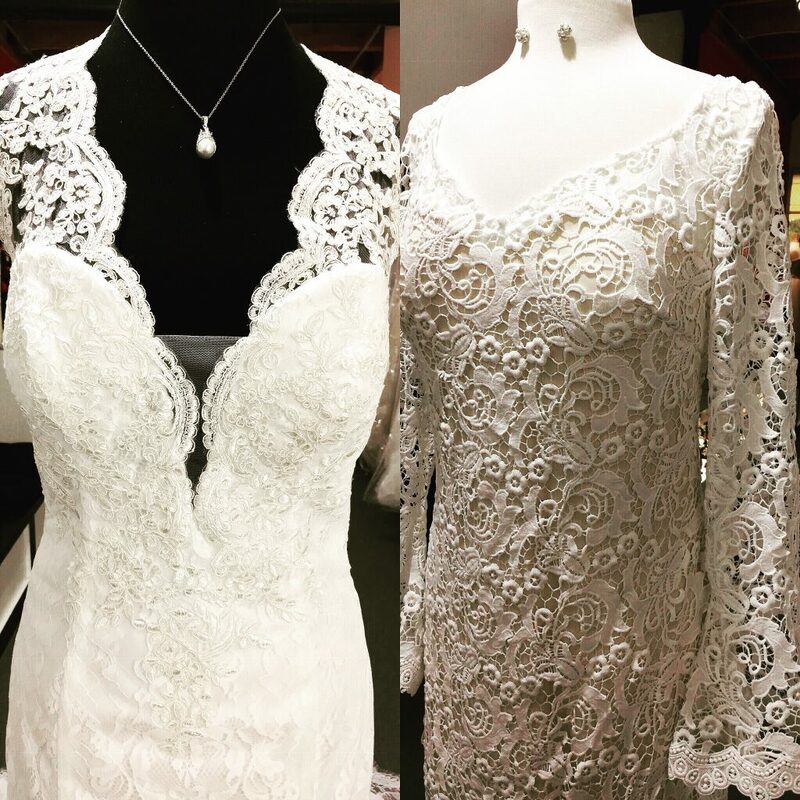 They’ve been serving Brides, Bridesmaids, Mothers & Prom for 35+ years. 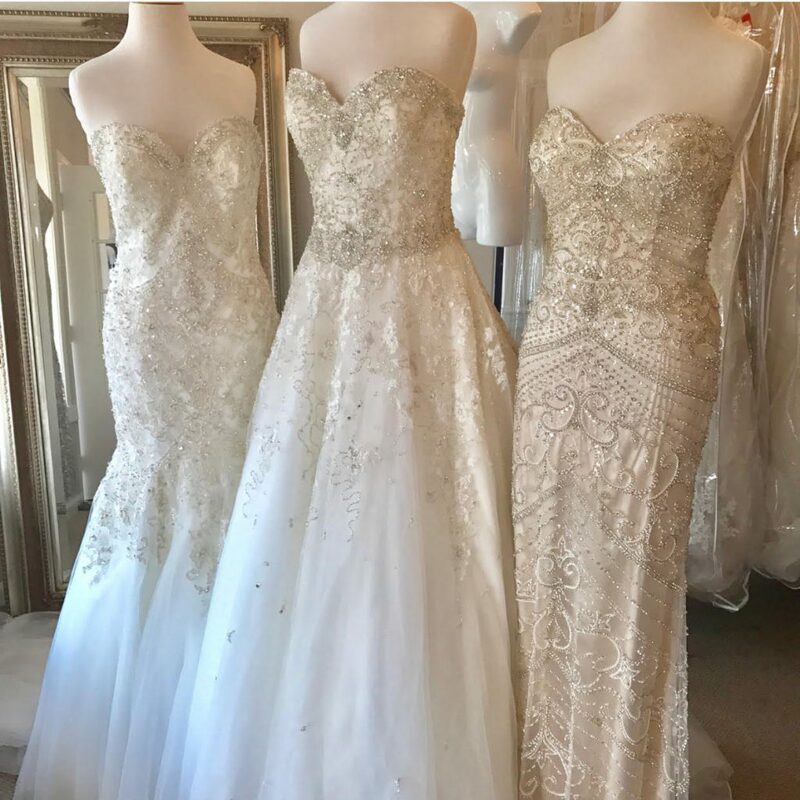 This exquisite trio of beaded gowns are priced all under $1299! 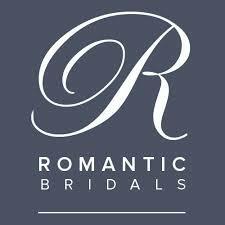 Brides on a budget looking for something special should stop in Atlanta Street Bridal Company of McDonough, GA. 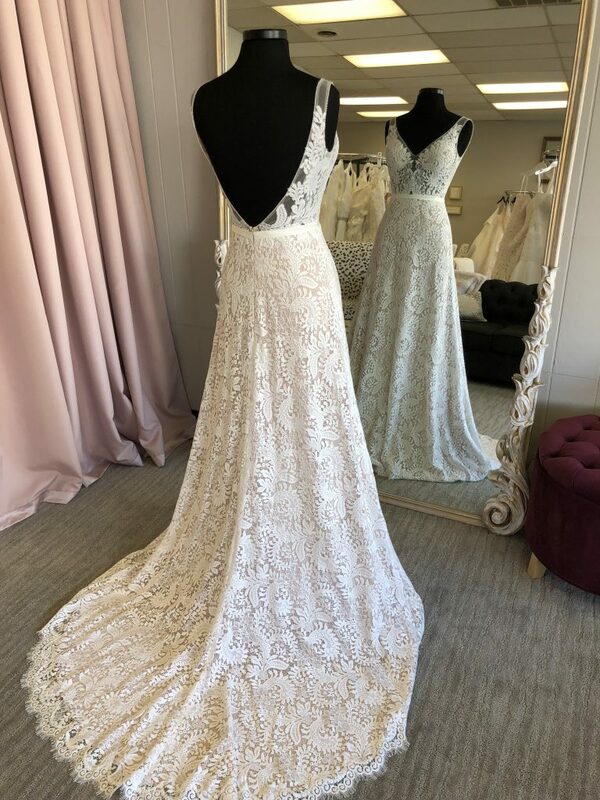 This beautiful strapless, lace appliqued gown is less than $1299!!!! 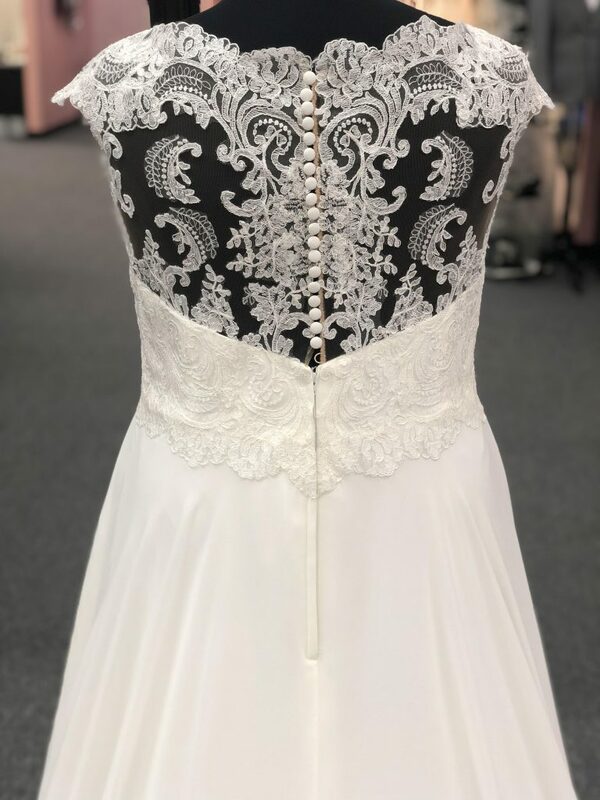 Perfect Weddings Bridal of Lancaster, OH has three amazing dresses for brides looking to save money without sacrificing style. 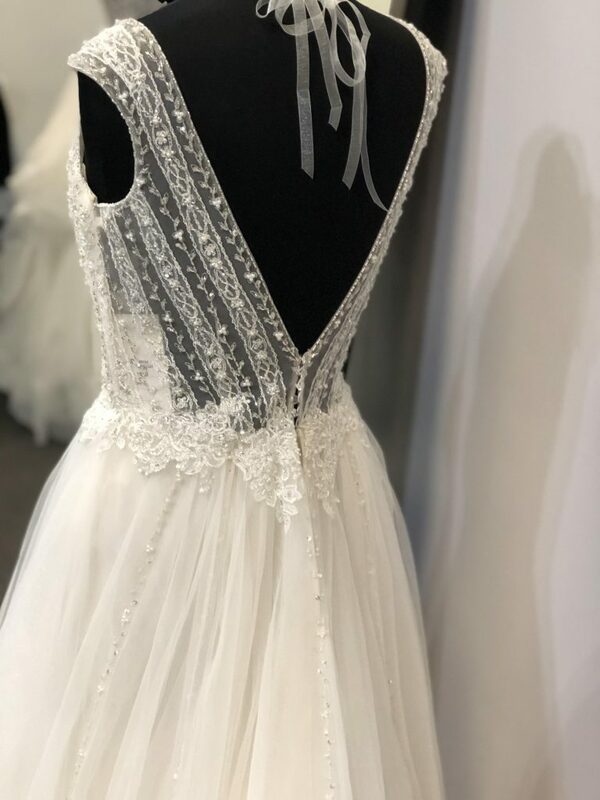 The first option is by Justin Alexander and is an adorable tulle a-line gown with a Sabrina neckline priced at just $999. 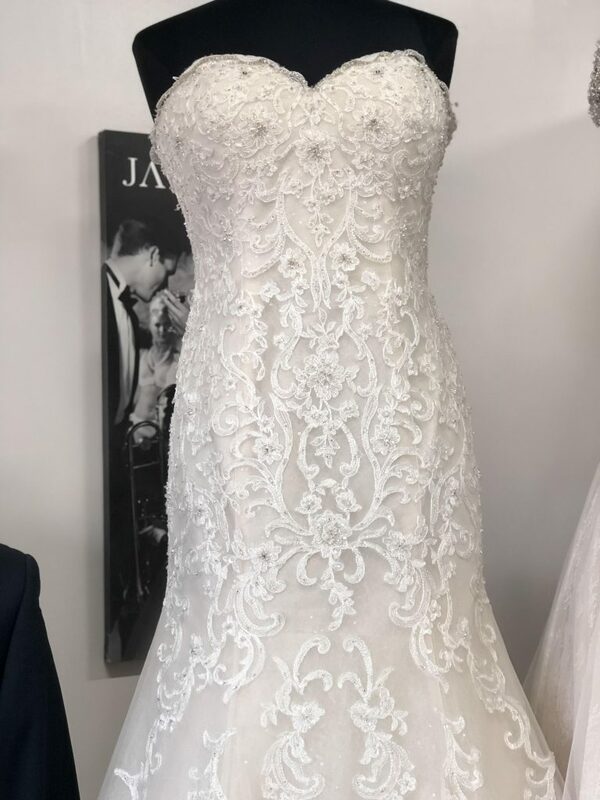 Also by bridal designer Justin Alexander, is this slim vision of loveliness with a Venice lace embellished bodice for $1025. 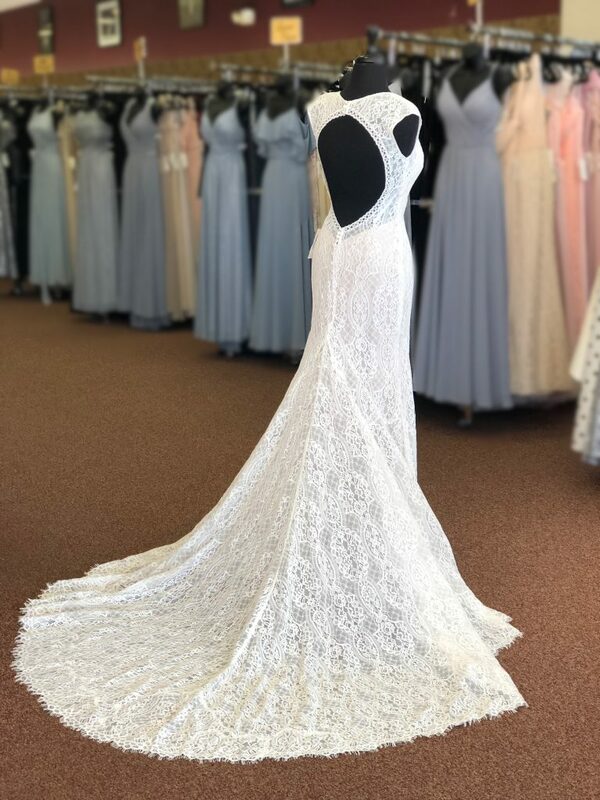 This beautiful corded lace and Mikado gown, also by Justin Alexander, won’t break the bank at just $1049. Oh, and it has pockets, too, so you have a place to put all the money you’ll save! 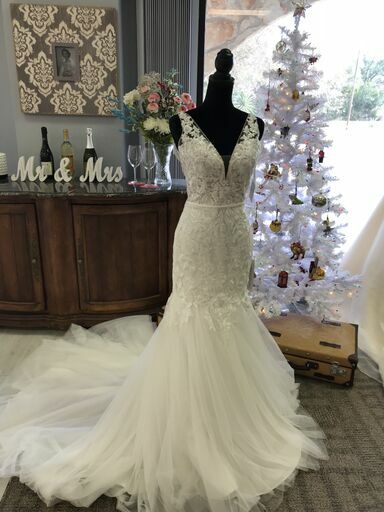 Gypztoz Bridal Boutique of Wimberley, TX can help budget savvy brides. 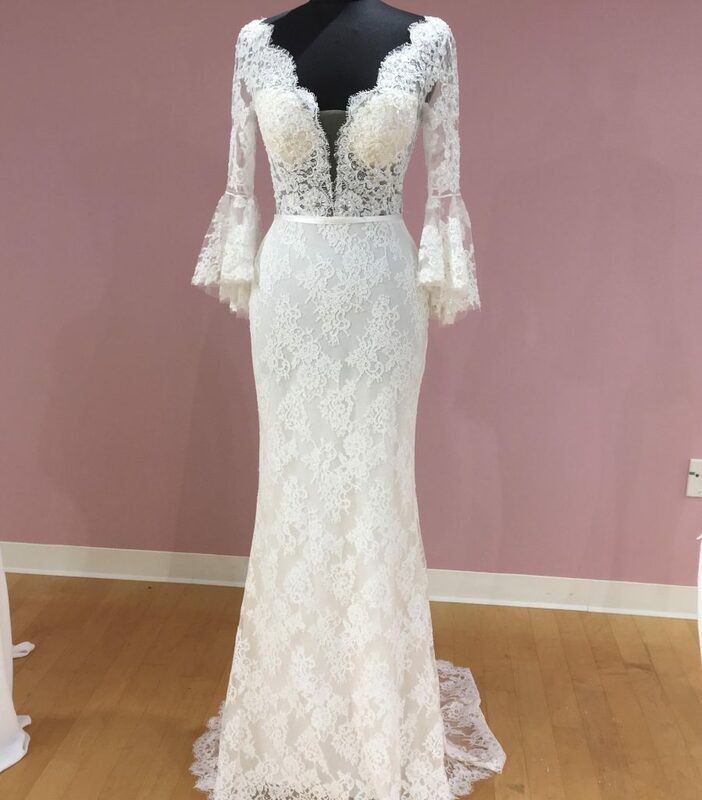 How about this long sleeve plunging v lace stunner, for less than $1299? 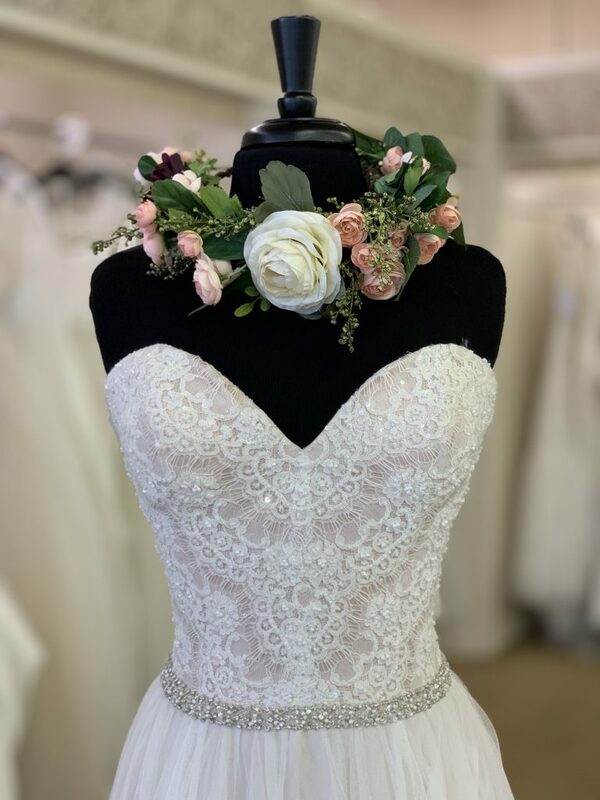 Or if you are looking for a fit and flare with a lavish lace bodice, consider this alluring option at Gypztoz. 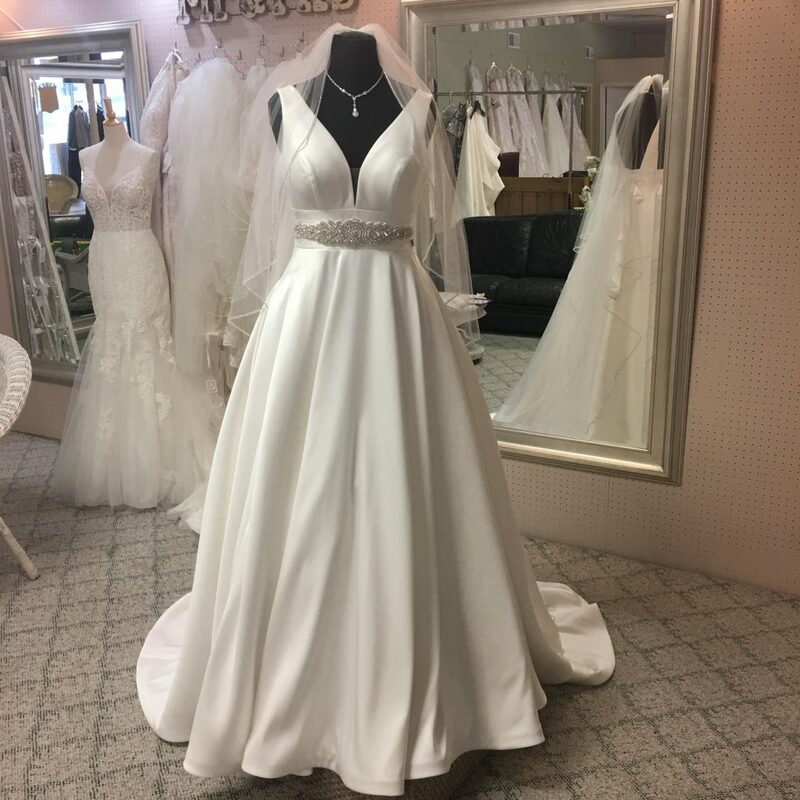 Celestial Selections Bridal of Spokane, WA has two superb selections at special price points. 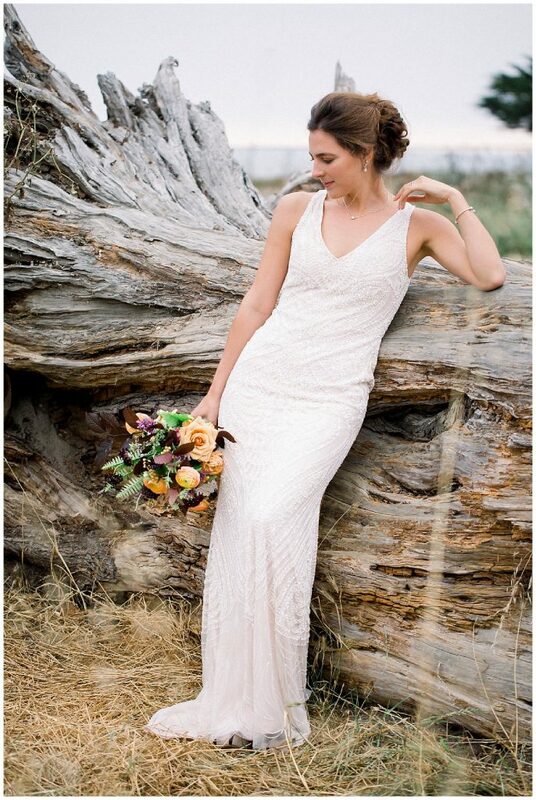 First up is a sparkly, A-line gown by Allure for just $1189. 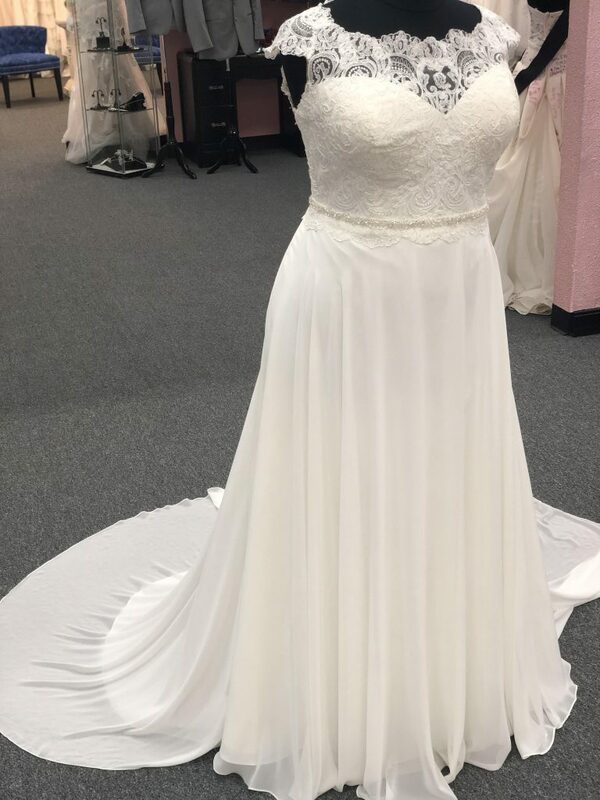 We adore the sheer illusion top and dainty waist detail on this gown. 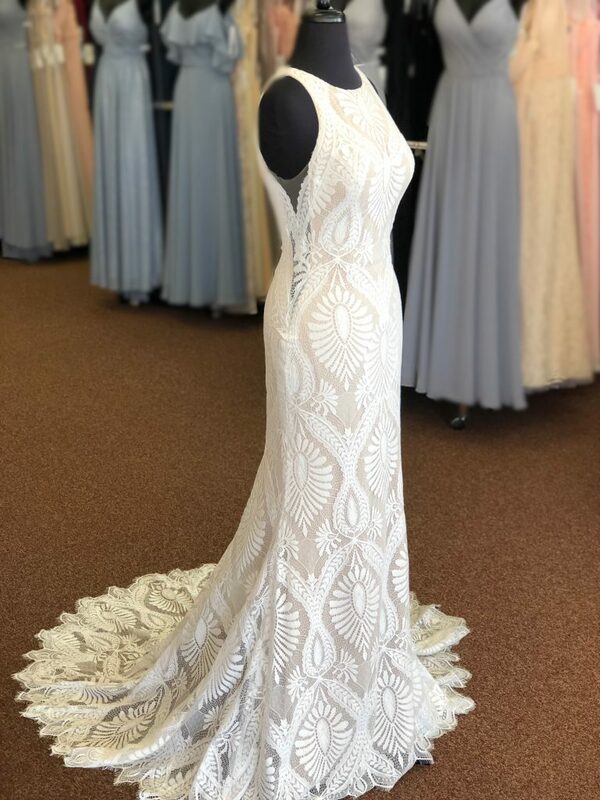 The price will make you smile, too, since this gorgeous gown is only $916. 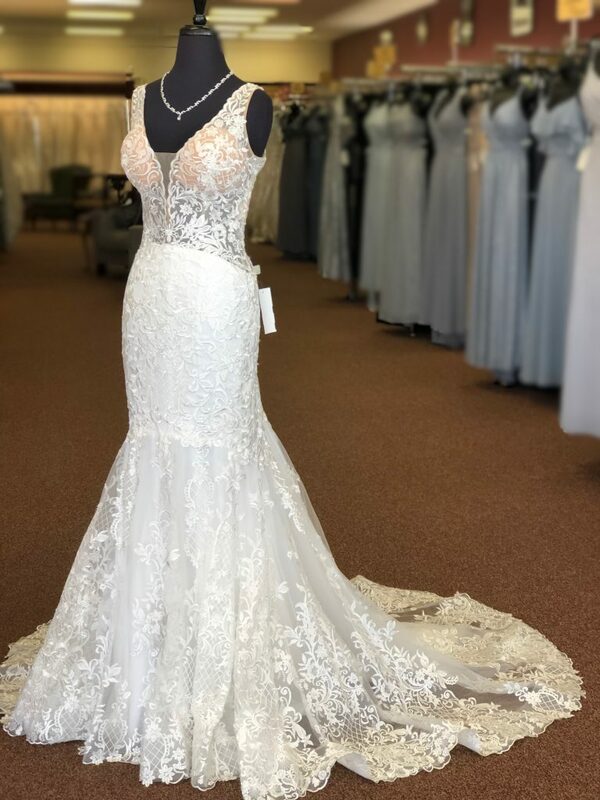 Facchianos Bridal and Formal Attire of Broken Arrow, OK is a full-service salon with a beautiful selection of affordable gowns. 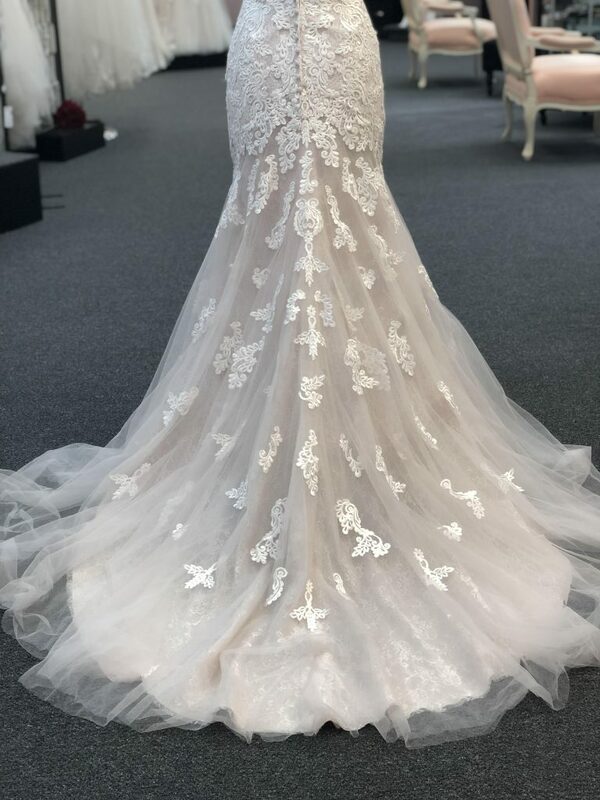 One charming choice, is this unique bell-sleeve lace gown with a delicate waist detail. 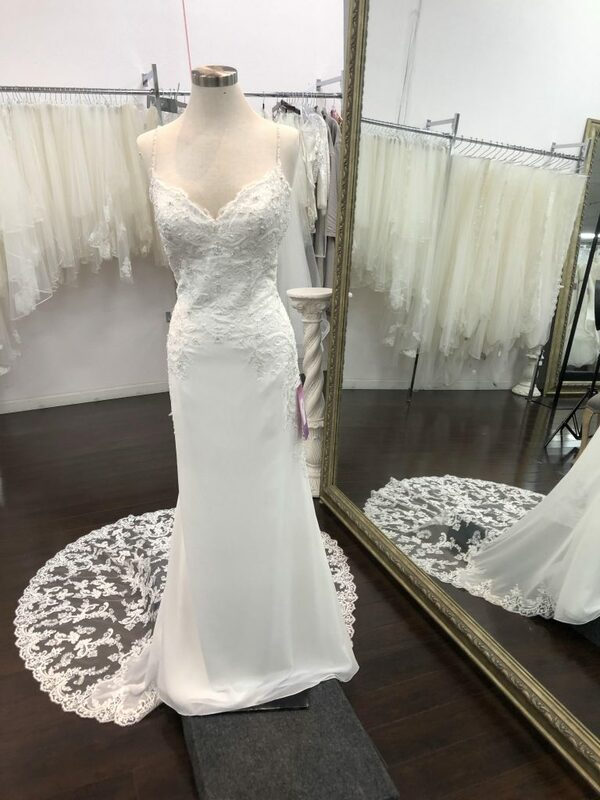 Another option under $1299 is this stunner with deep v neckline and jeweled belt. 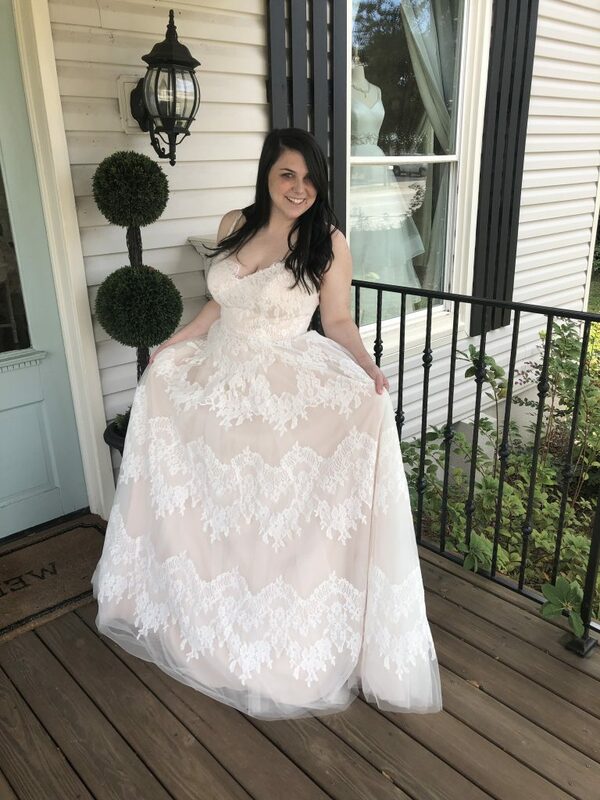 Flirty and fun, this spaghetti strap ballgown is full of romance and easy on the wallet! 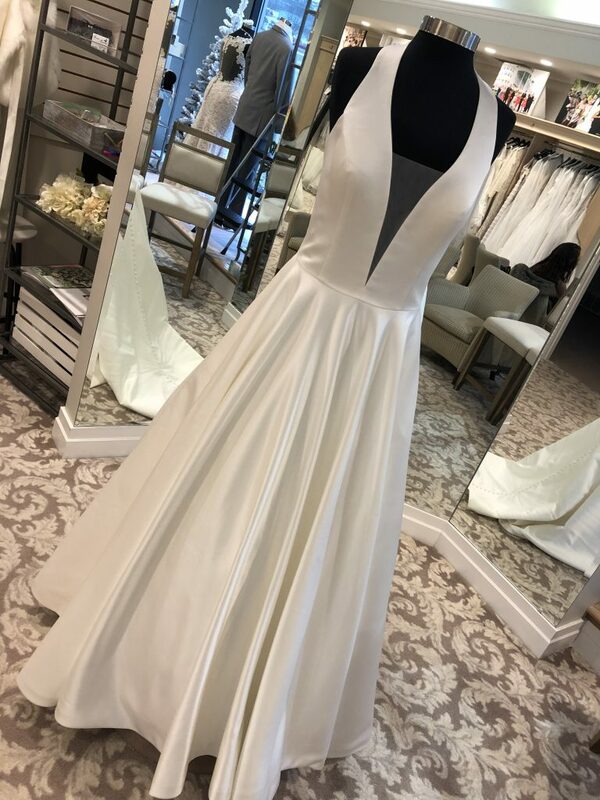 Or, perhaps you are looking for the simple sophistication of “Andie.” This lovely is priced at just $795! And. It. Has. Pockets. 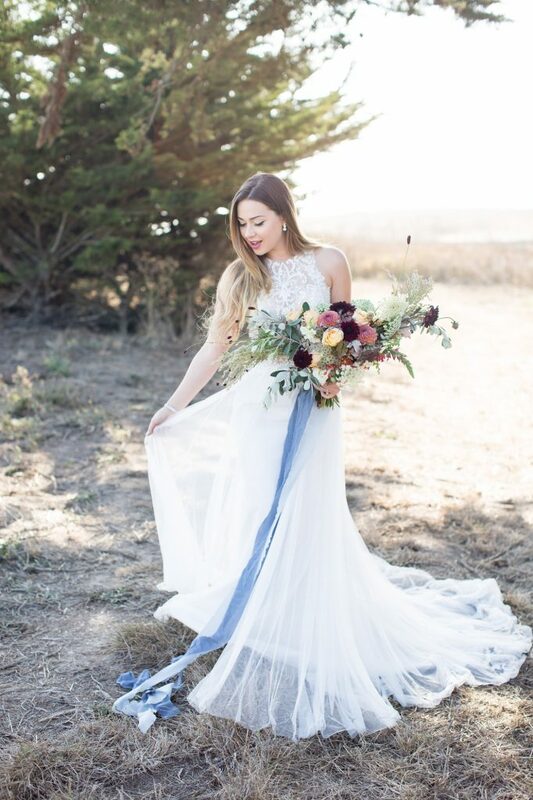 We love the boho vibes “Austyn” is bringing, high neck and all! It’s super affordable at $795, too! 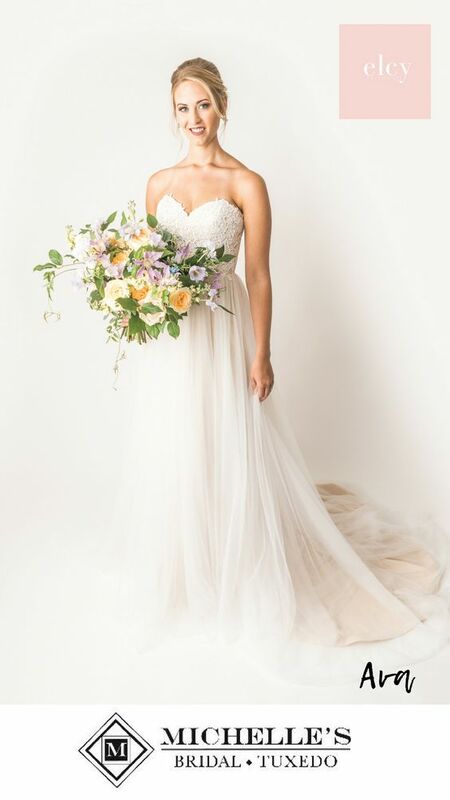 Michelle’s Bridal also has this dress, “Autumn” with a fresh modern look and a fabulous price tag of $795. 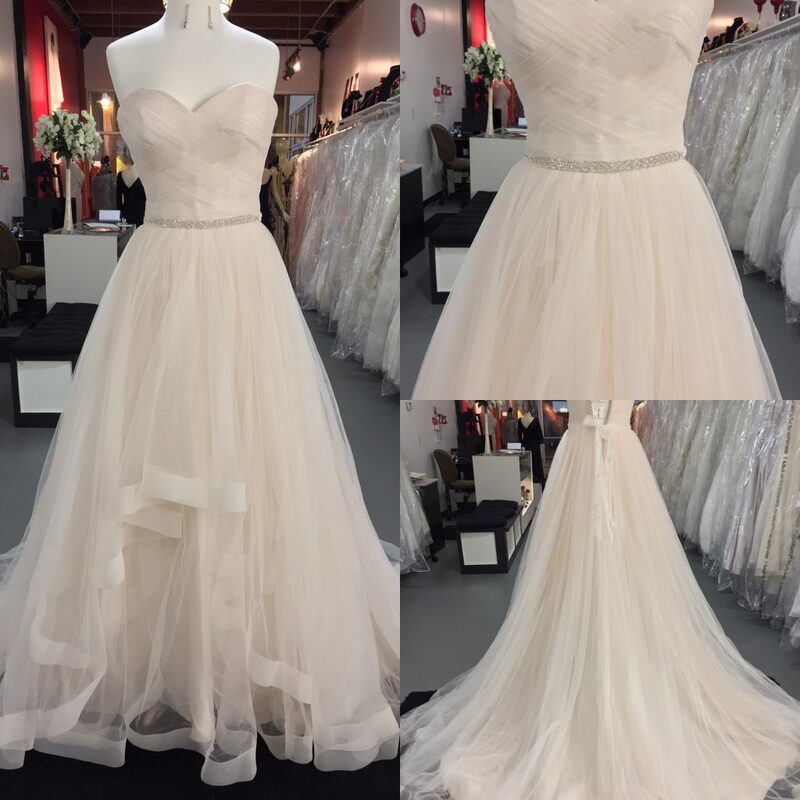 “Ava”, at $795, is all softness and light with a sweetheart neckline and flowy skirt. 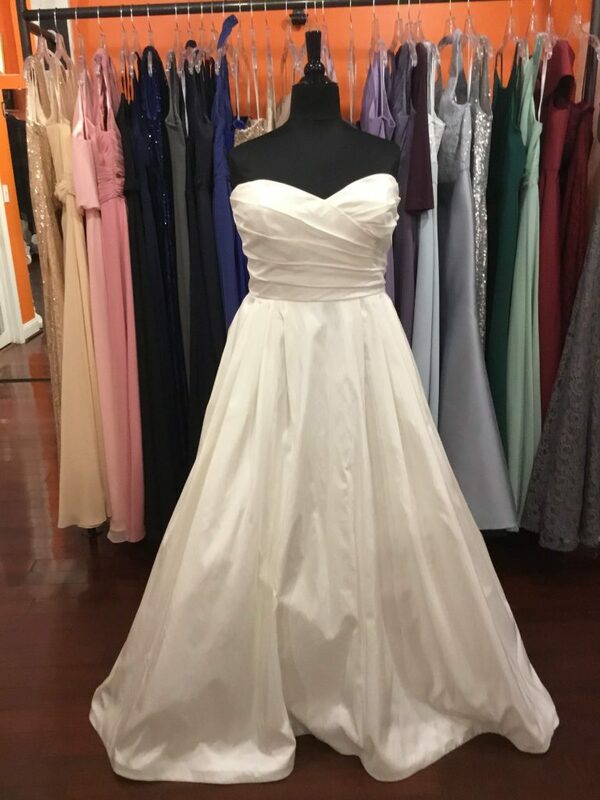 Aliber’s Bridal of Greenfield, MA offers this simple sweetheart, strapless dress for $1079. We just love the classic silhouette and clean lines. 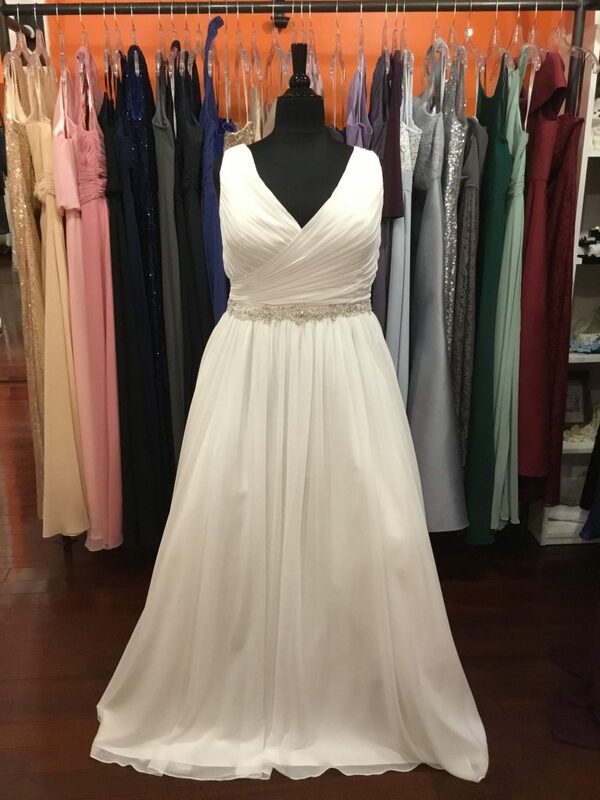 Another option from Aliber’s is this charming v-neck gown with a beautiful beaded waist and flattering ruching, priced at $1192. 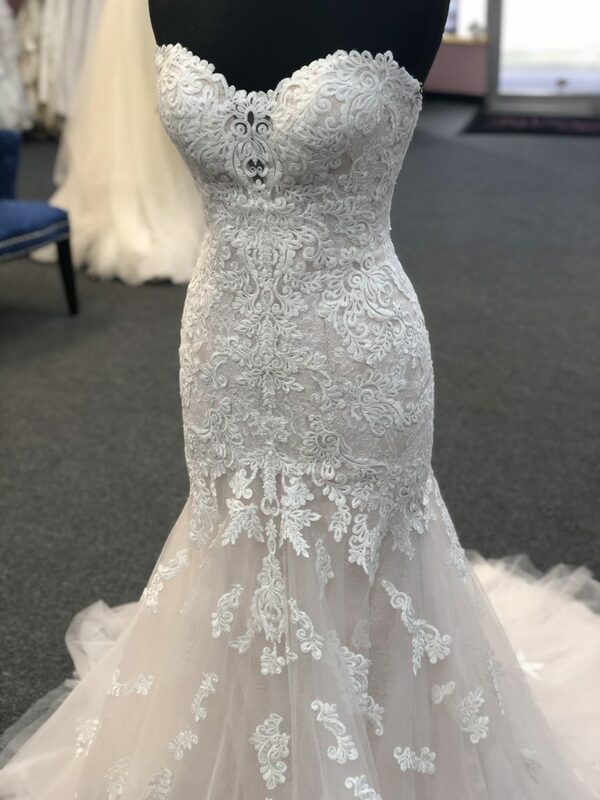 Wolsfelts Bridal of Aurora, IL stocks this pretty option from Allure. 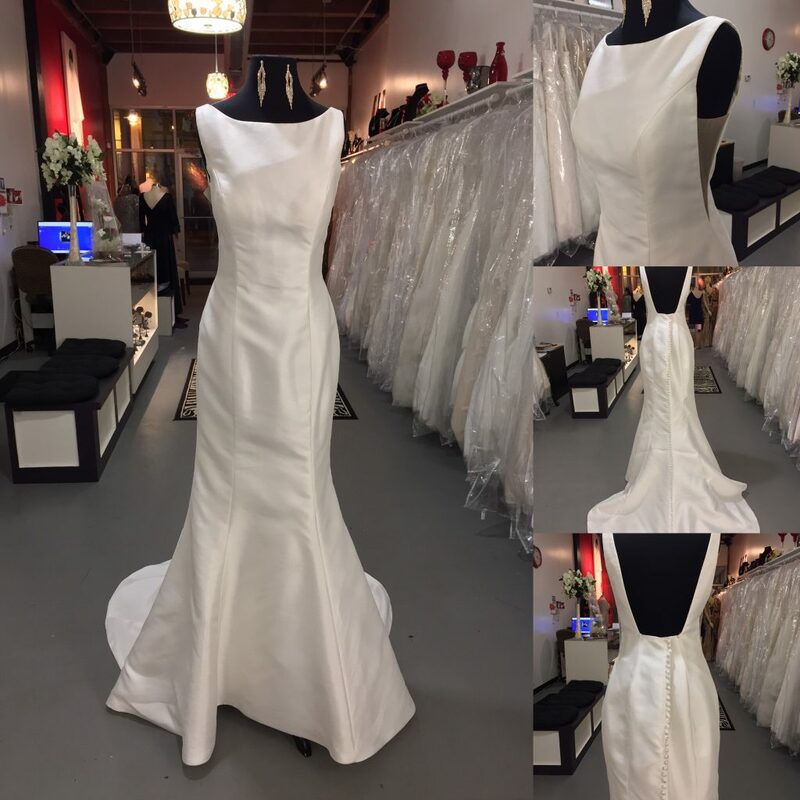 At $1099, this gown delivers major understated style impact. 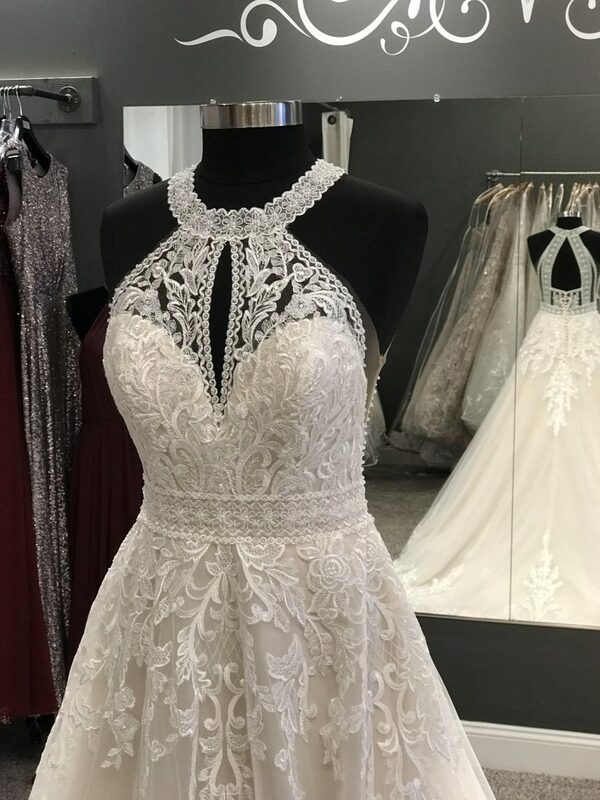 The cut-out lace train is amazing! The keyhole back adds an element of fun flirty-ness we love! 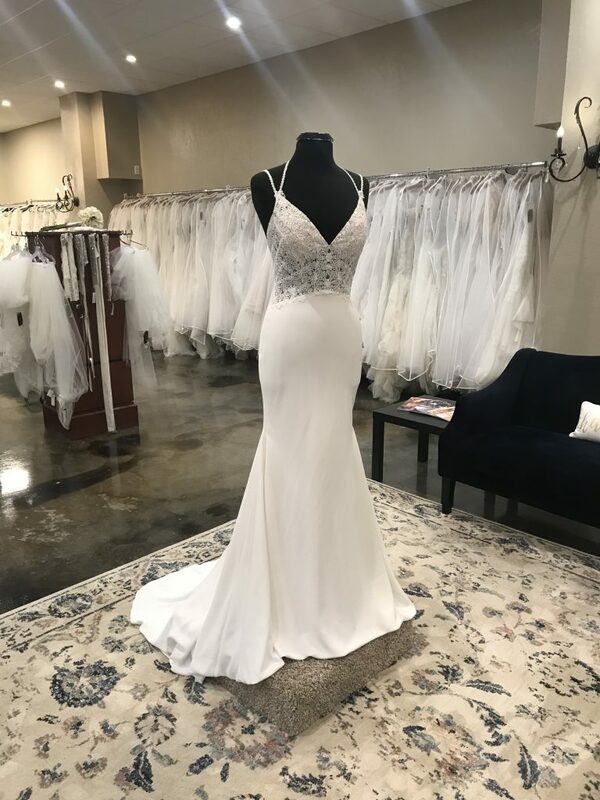 All About The Dress in Victoria, Texas has a stunning option for discerning brides looking to save money without sacrificing style. 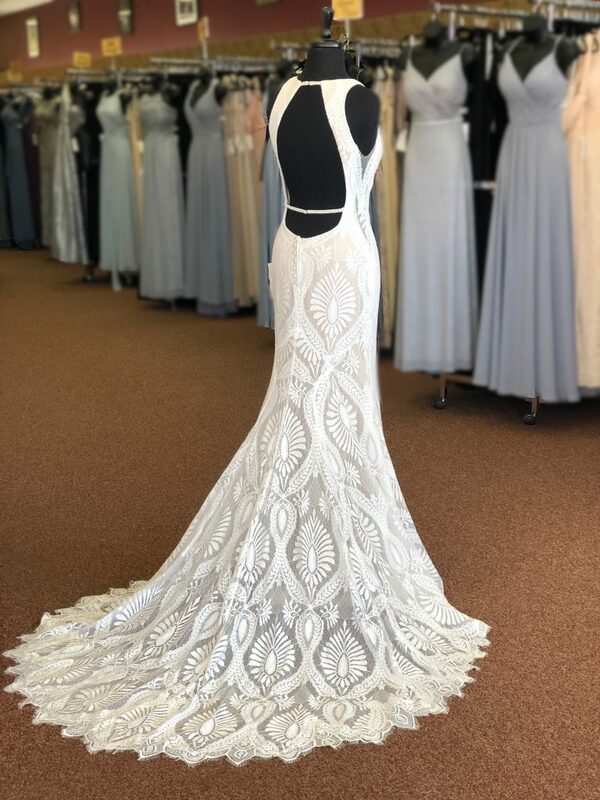 This double spaghetti strap gown with a sheer lace bodice is very well-priced at $1257. 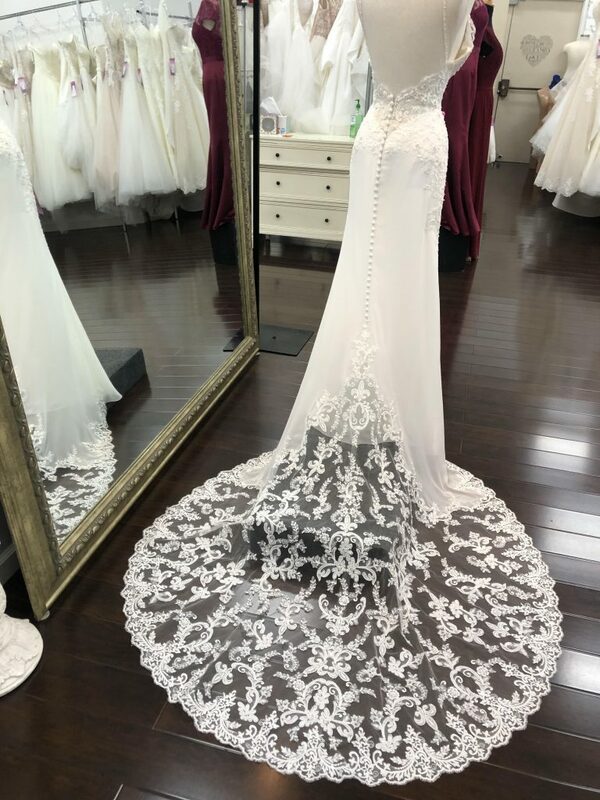 This dress has a super pretty back view, too. 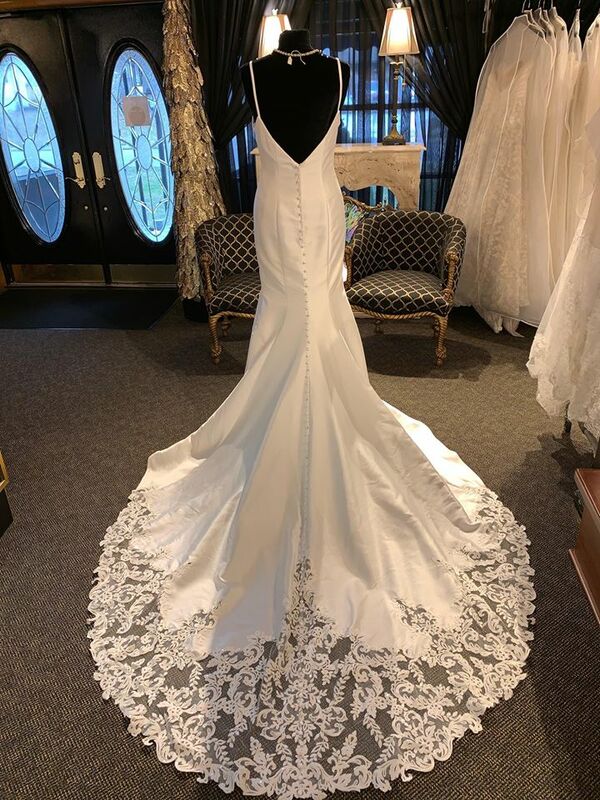 Simply Elegant by Cheri of Lincoln, Il has this amazing wedding dress, priced under $1150. 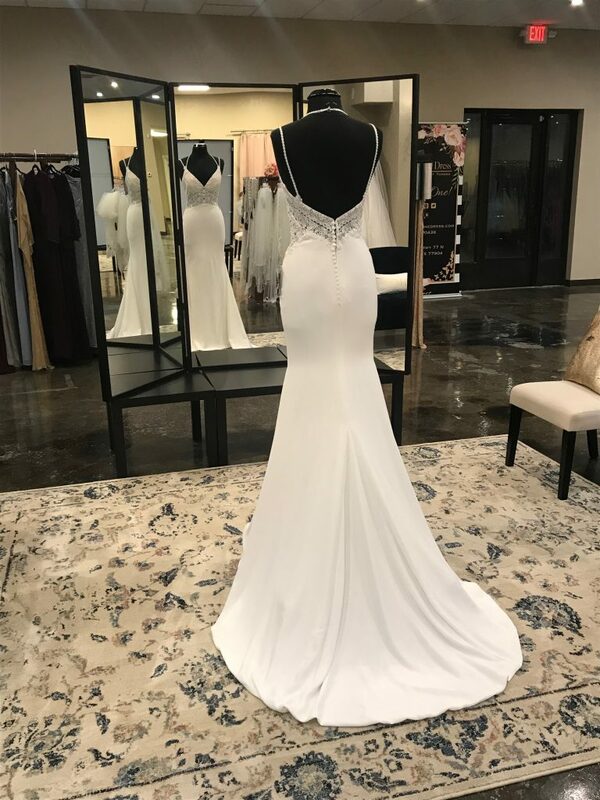 We love the spectacular back! The sheer side panels are fabulous too! 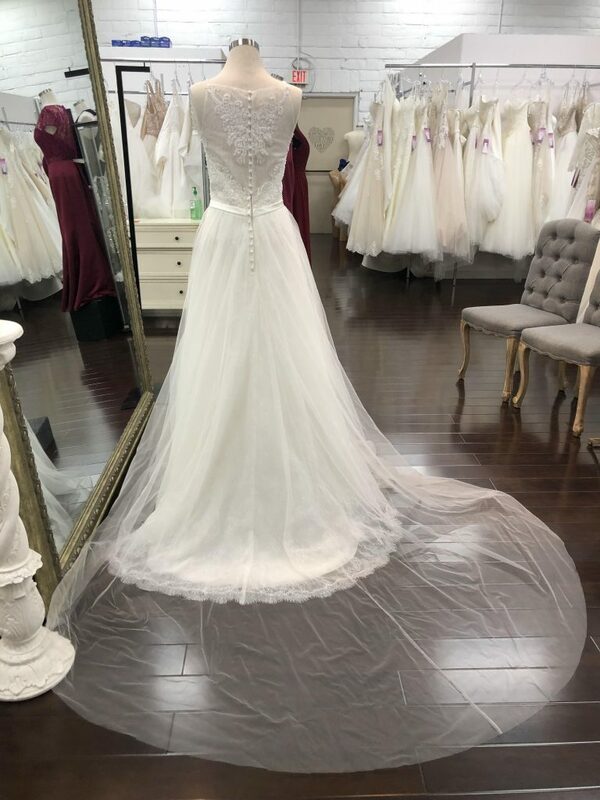 This is definitely a dress that delivers major, major style with a very pretty price! 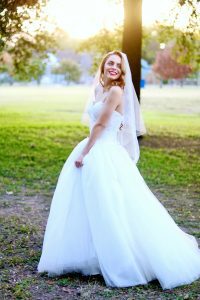 Looking for a wide array of affordable bridal gown options? 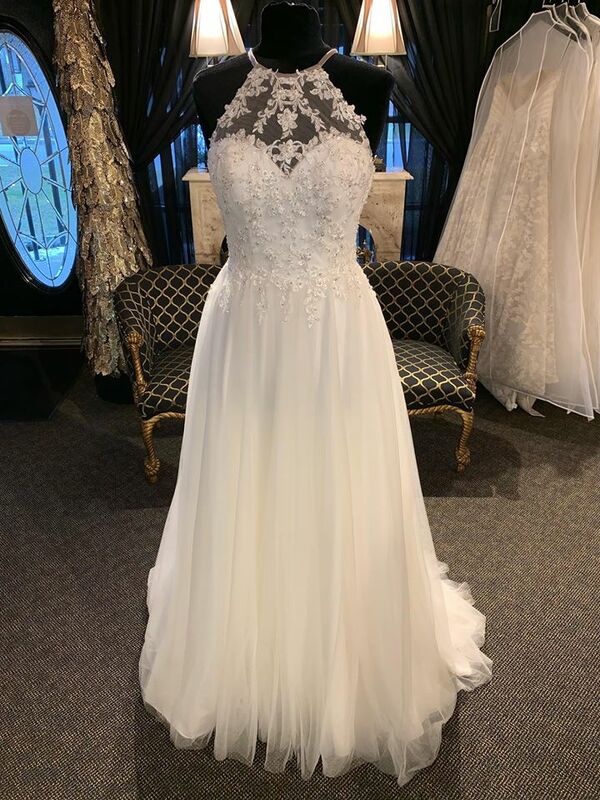 Try Scarlet Bridal Boutique of Rochester, NY. 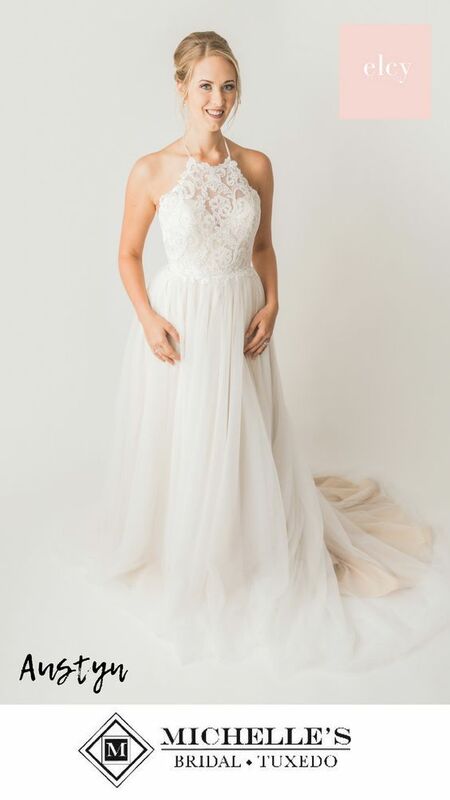 They have this gorgeous Abree gown in Rose Quartz in a size 22 available for $1100. 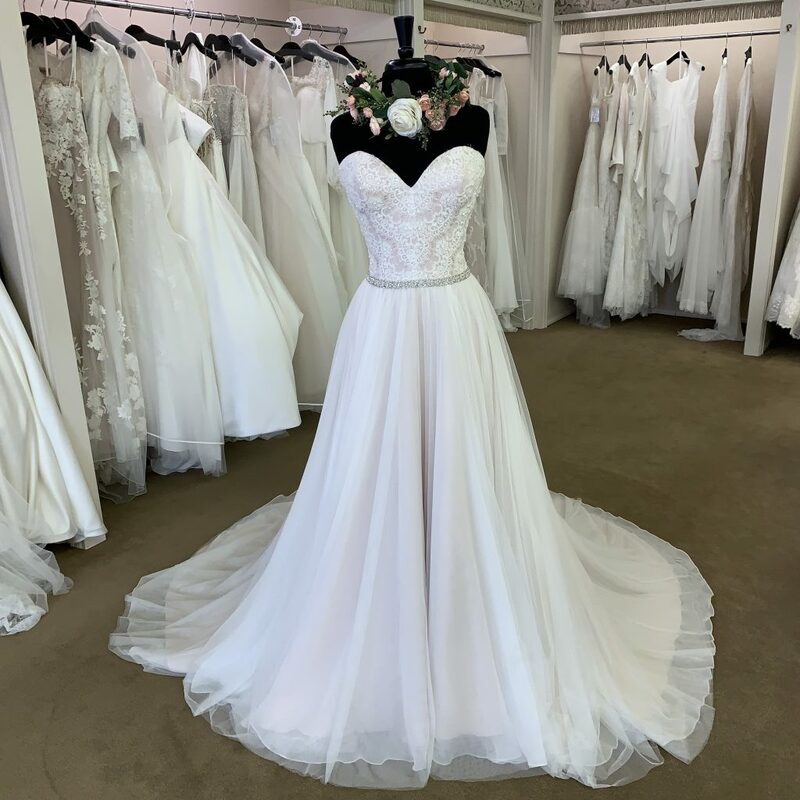 If a soft pink ballgown is more to your liking, we suggest this romantic option, in size 10, which is available for $899 at Scarlet Bridal Boutique. Craving the body-hugging feeling only a fit and flare gown can provide? 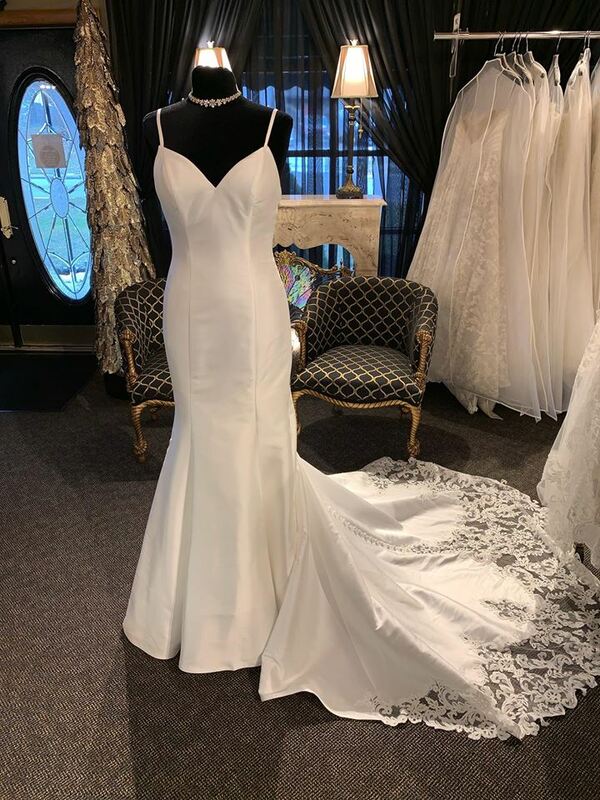 Consider this Sottero Midgley Ivory Mikado gown, size 12, for $925. 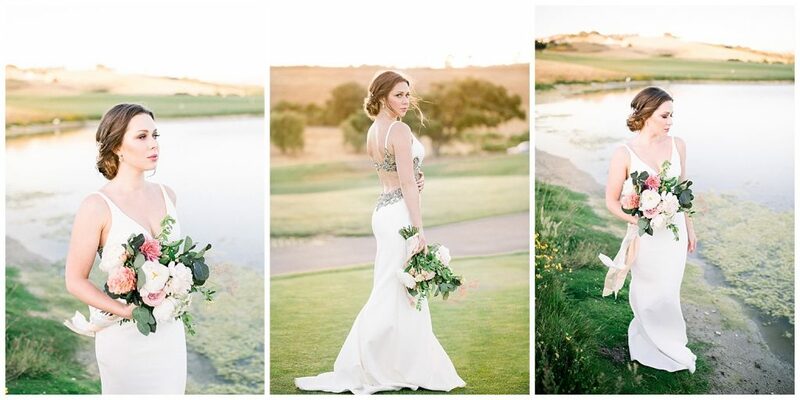 Also available at Scarlet Bridal Boutique are these beautiful gowns by Abree. 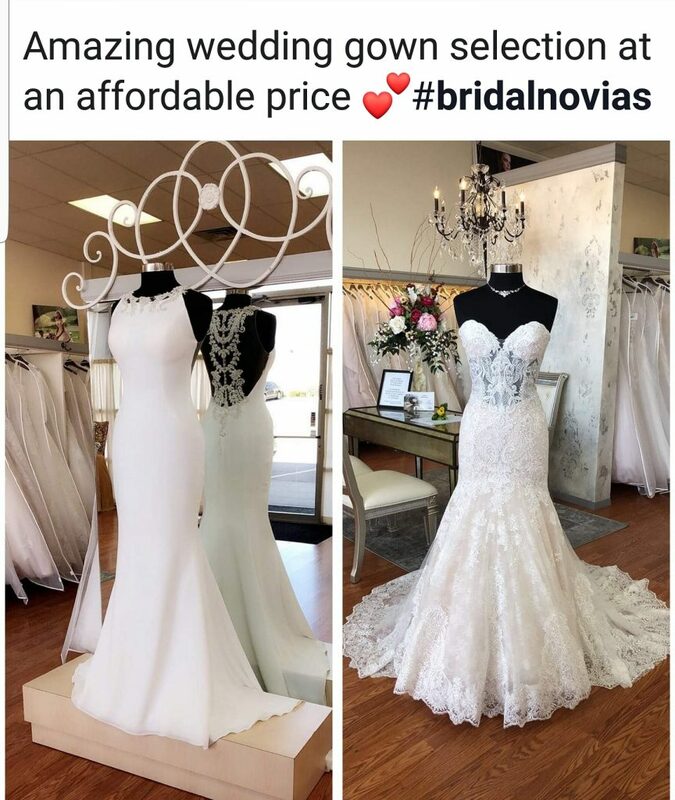 Pictured at left is “Jolie” with a plunging v neckline in size 8 for $1100 and on the right, a long sleeve ivory lace gown “Violet” in size 16 for $999. 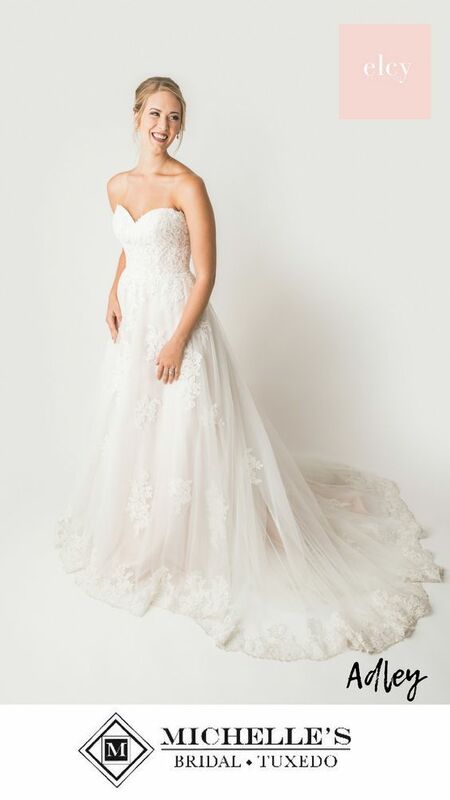 The Gilded Gown in Knoxville, TN specializes in affordable, stylish wedding dresses. 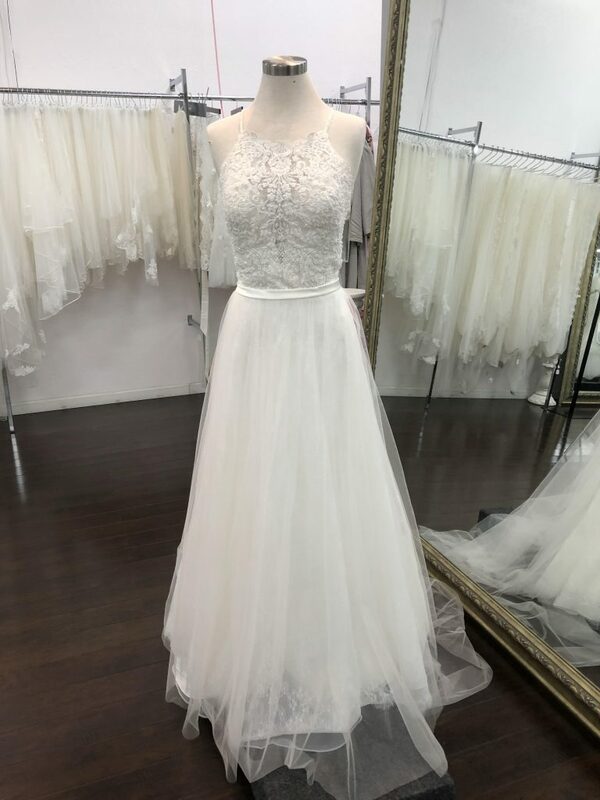 One of their most popular options is this dainty Sweetheart gown composed of soft English net and tulle with an illusion Venice lace bodice. 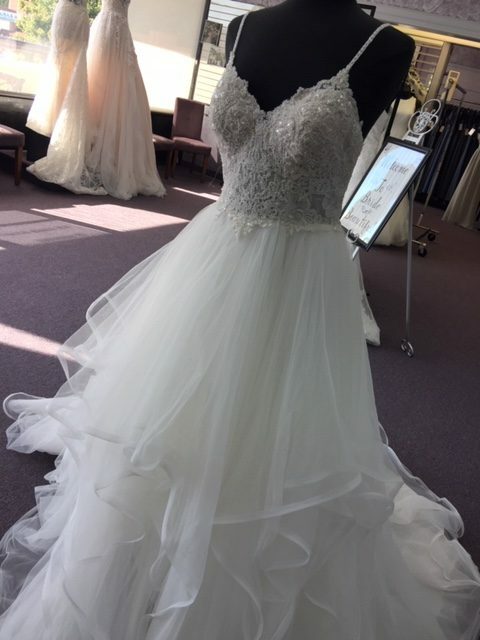 This beauty comes in under $1299! 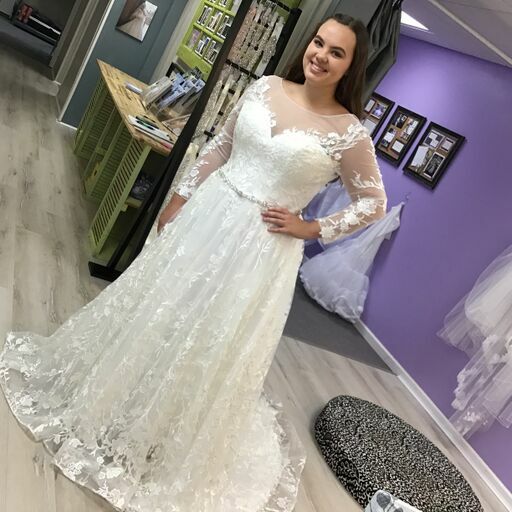 To see more inexpensive gowns available at The Gilded Gown, visit their latest blog post on affordable gowns. 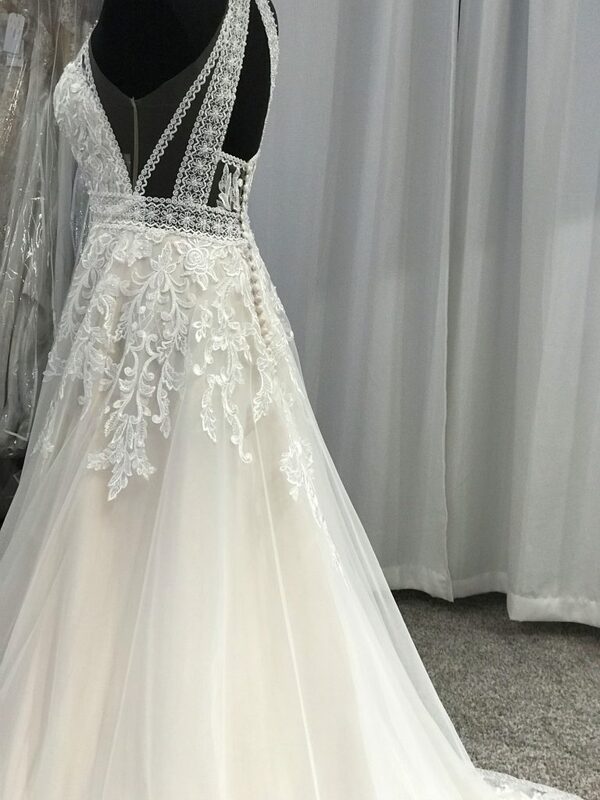 Bridal Novias of El Paso, Texas has so many gorgeous gowns. We love these two affordable options. 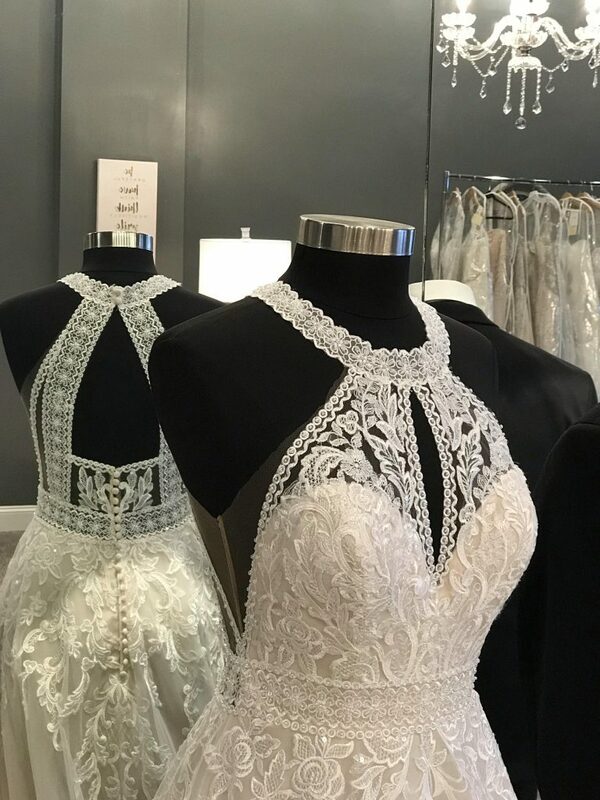 The first dress, at right, features an incredible back piece for $1298, and the saucy second gown, at left, is just $1448! 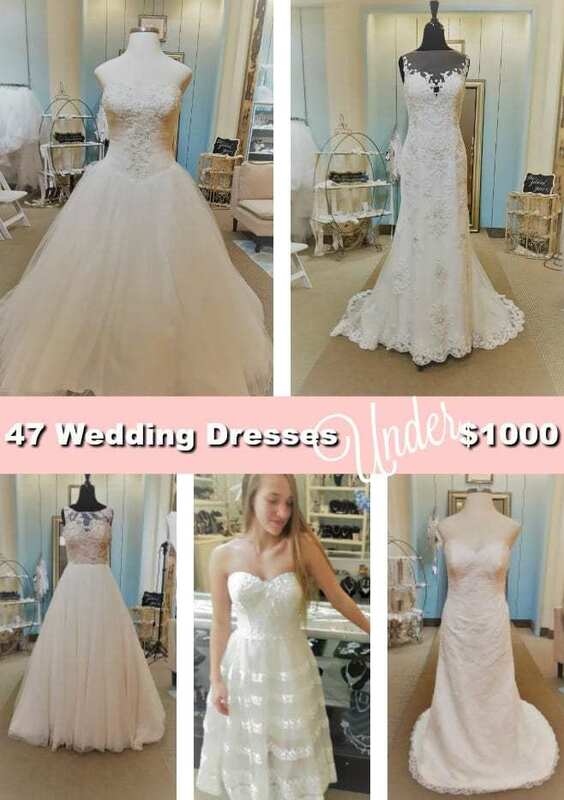 The Bridal Gallery Salem of Salem, OR has an enchanting array of beautiful wedding dresses at fantastic price points. 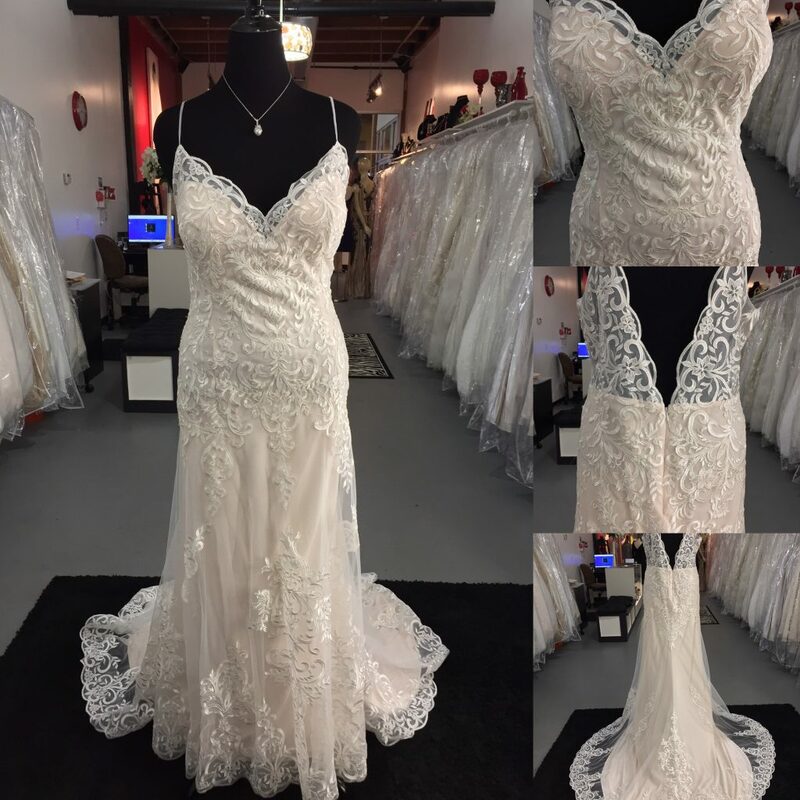 First up, this gorgeous strapless gown adorned with lots of lace appliques for only $1199. 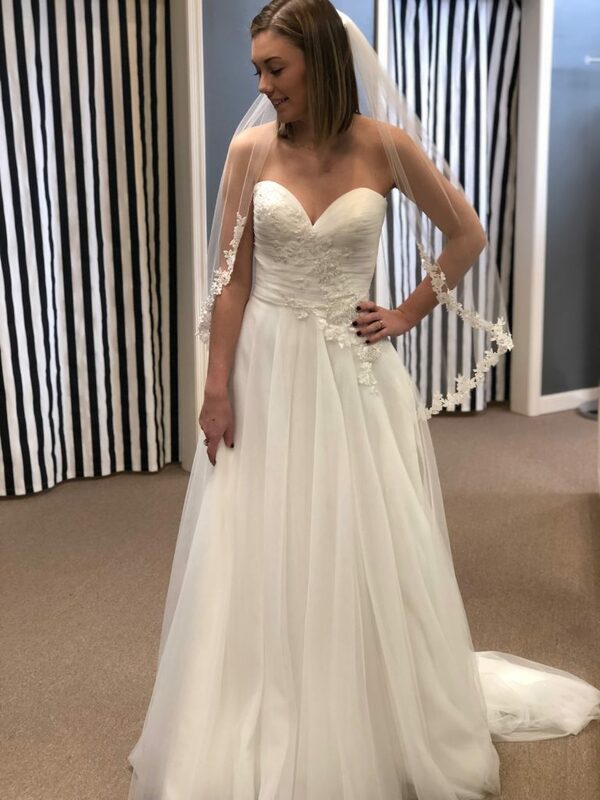 An amazing $999 will put you in this lovely and delicate dress at The Bridal Gallery. 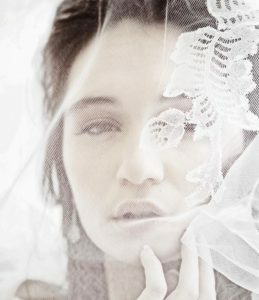 Bridal Elegance of Grand Rapids. 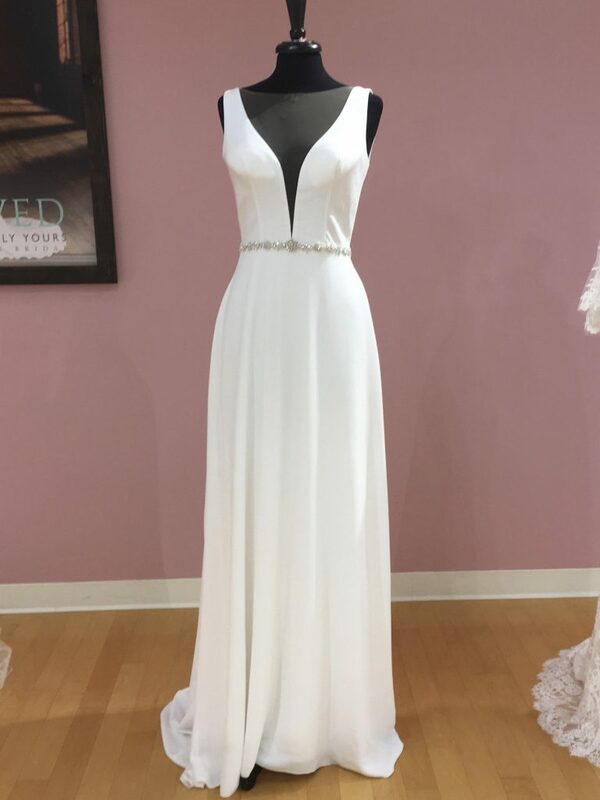 MI offers an amazing option for $1200 with this dramatic gown with a plunging v neckline. 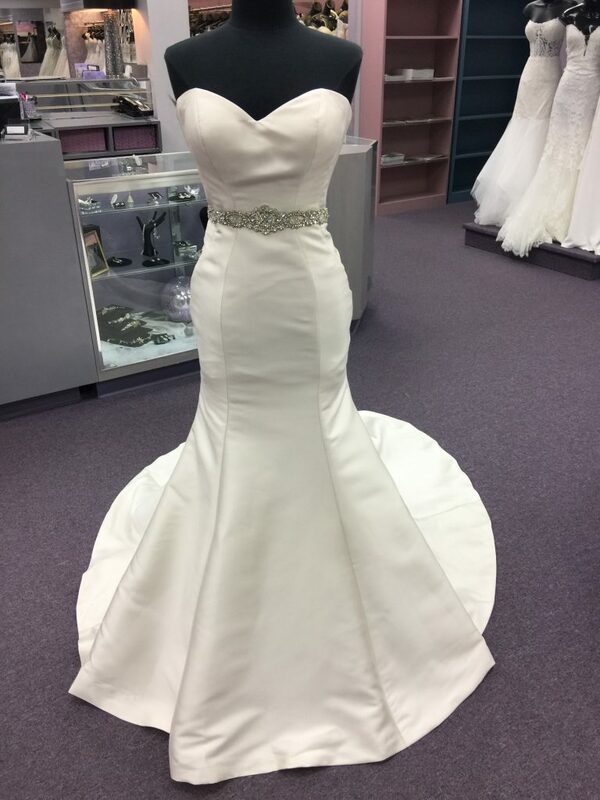 Main Street Bridal of Carlinville, IL stocks fabulous and well-priced wedding dresses. This option, at below $1299, features a fresh, clean, modern look. 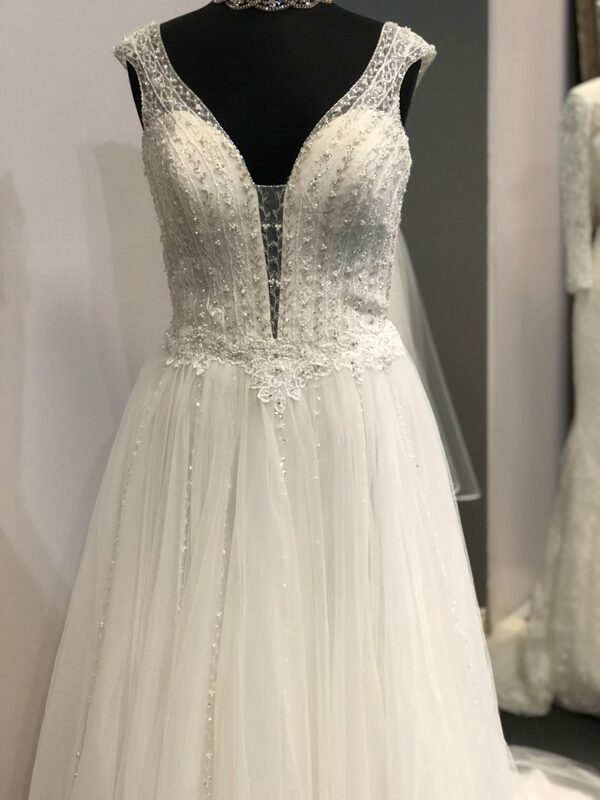 Unbelievably affordable, this short sleeve gown, also priced under $1299, is composed of dreamy tulle and lavish appliques. 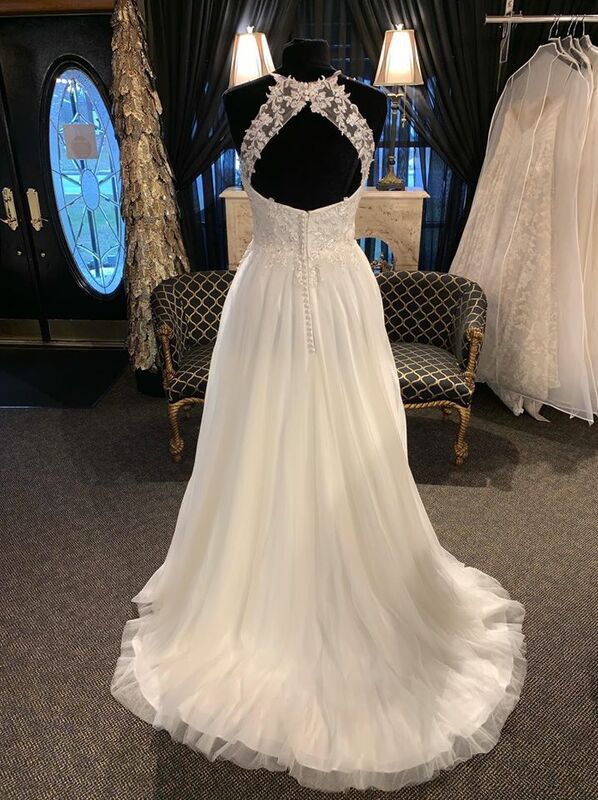 Your wedding dreams can come true, with this gorgeous halter gown with a lovely illusion back. This one is only $1058 ladies! 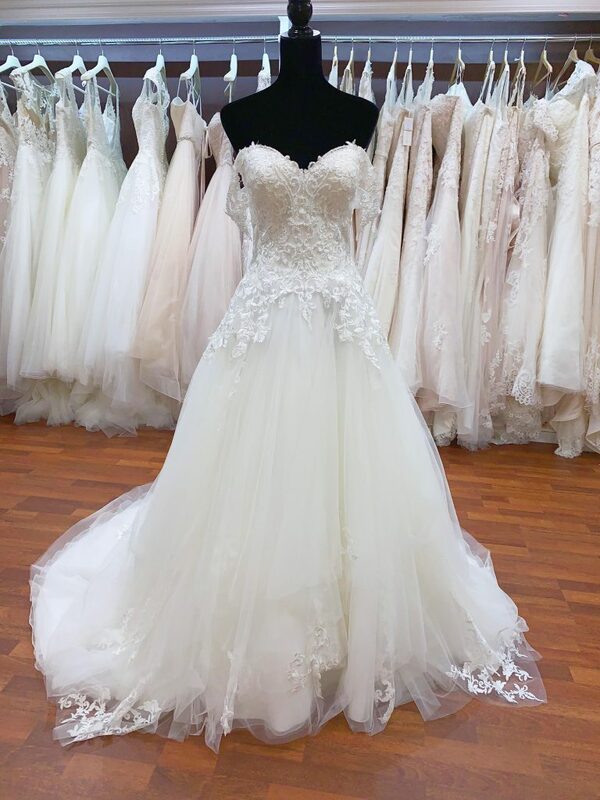 Aurora Bridal of Melbourne, FL has a dazzling array of wedding gowns. 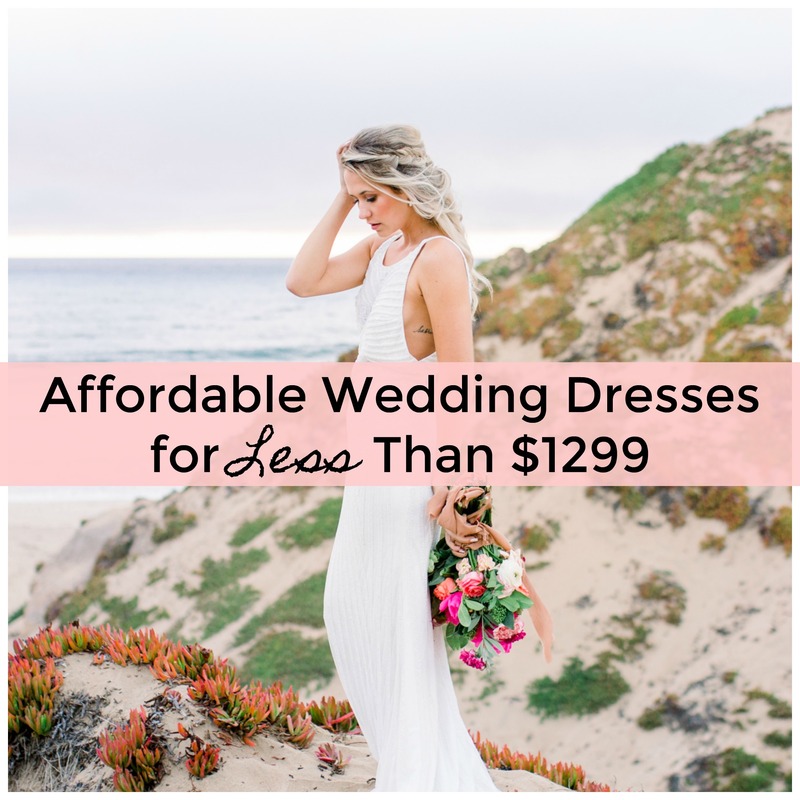 Their best options for brides on a budget? 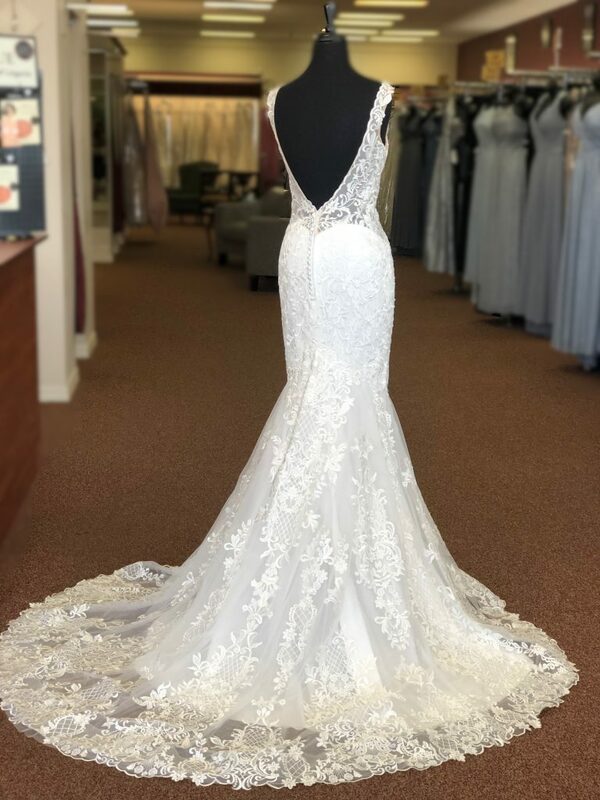 We suggest this alluring Mori Lee for $1,199. Or, this whimsical Wilderly, for $1,099. Or, this wonderful Wilderly, which is only $1,279. 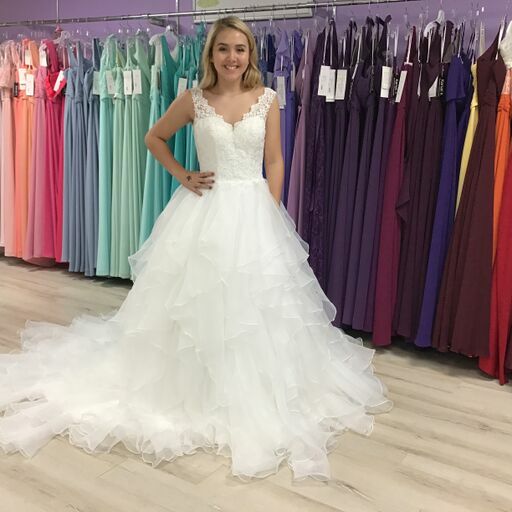 Bridal Traditions of North Wilkesboro, NC has an alluring selection of affordable gowns. 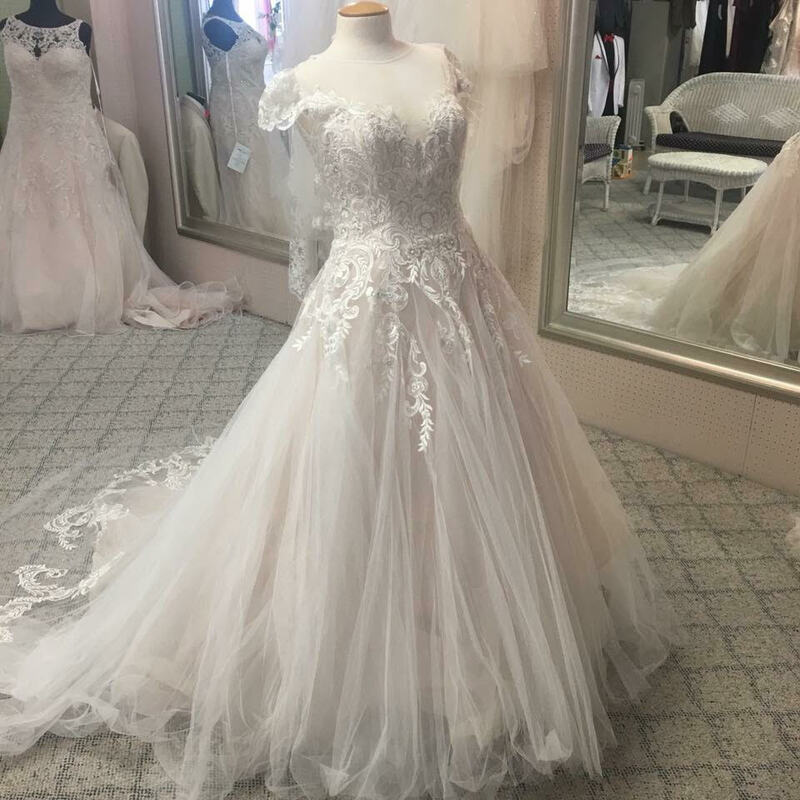 This romantic ballgown with its ethereal, cascading skirt is less than $900! 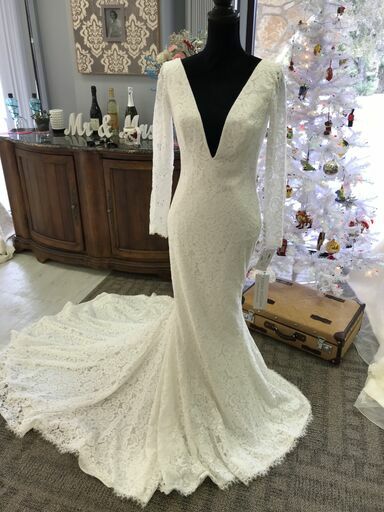 And this long-sleeve beauty with major lace details can be yours for less than $1000! 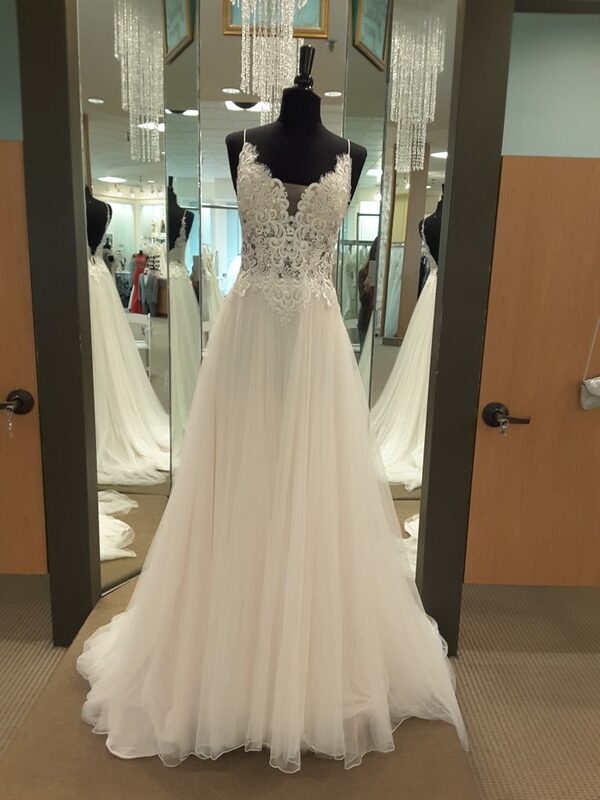 Spotlight also offers this adorable plunging v neck gown with lace appliques at below $1299!